YESTERDAY: The famous corner of Five Points in the 1930s, SE corner of 2nd St. and Washington Blvd; the Southwell building is now 2 stories high due to a fire on third floor; the building is more commonly known as Five Points Drug; an electric street car in foreground and cars on the left; photo Clyde Bramwell. TODAY: SE corner of Washington Blvd. & 2nd St; photo 2014. At the turn of the century it was time to look back and celebrate how far the settlement had come in the span of fifty years. Fortified by a sense of gathering, the Mormon pioneers had settled successfully in the Five Points area, built Bingham’s Fort and maintained order during the invasion of Johnston’s army just ten years after their arrival. Twenty years after their arrival, the railroad spanned the nation, met in Utah and crossed through Lynne Precinct. Following the railroad were 20 years of tension between the Mormons and the gentiles over the issue of polygamy which ended in the 1890 Manifesto. There were advantages that came with the railroad: economic stability and finally statehood in 1896, almost fifty years after the arrival of the earliest pioneers. By 1900 there were three political parties and three churches at Five Points. Individual choices of politics and religion were respected, and free education had been available for the last ten years. The hub at Five Points had many businesses with electric cars passing each way every few minutes. On the down side, there were five saloons at Five Points giving it a reputation for being a tough place. Arch Clapier started school in 1907 and use to run down during noon hour and gather the beer and whiskey bottles from the back of the saloon and trade them to the grocery store for candy. He said that the men came from Ogden to Five Points to get drunk. The prestigious Ogden Military Acadamy north of the Points gave way after seven years to the reform school. 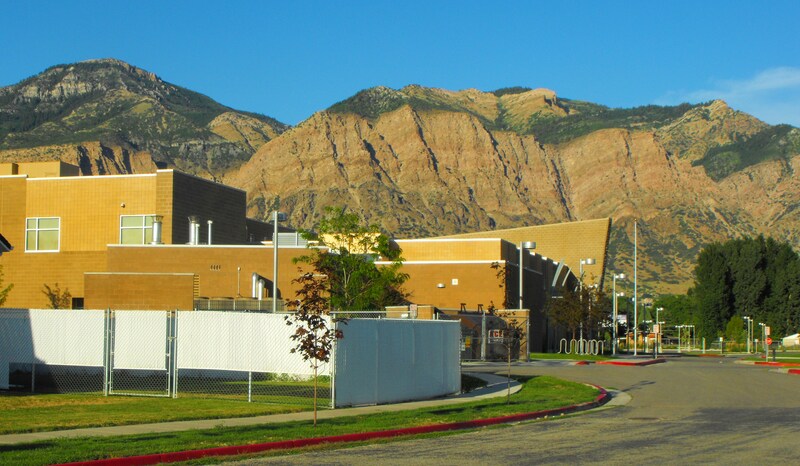 Some didn’t like the reputation that the Utah State Industrial School gave to the north part of town beginning in 1896. 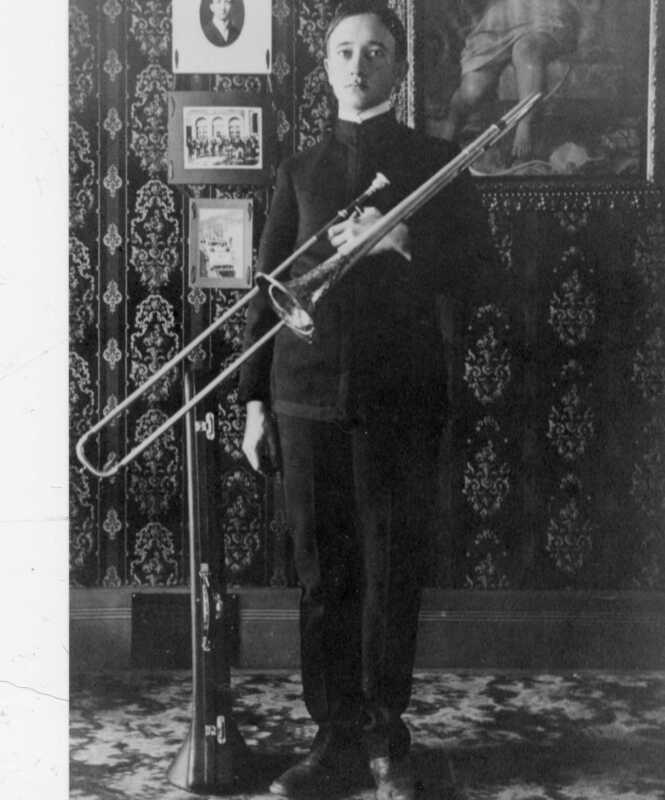 At the beginning of the Twentieth Century the reform school didn’t fortify the hopeful idea for Five Points to continue growing into Ogden’s biggest business district. The reform school remained in operation for the the next 87 years, closing in 1983. In 1900 farming around Five Points was just as successful as the booming business district. Both gentile and Mormon farmers sought farm based economic stability and family values. 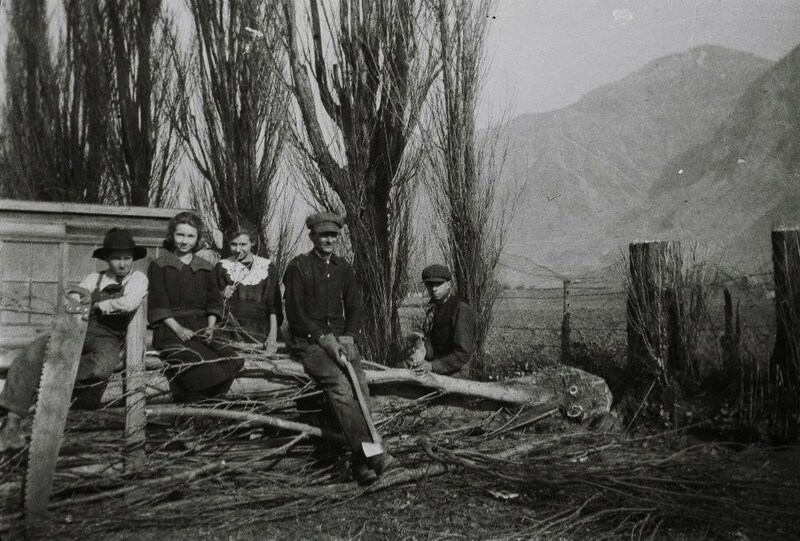 The farmers shared farm work and machinery and became friendly gentile-Mormon groups. The pioneers had settled the farms on the west side of Five Points in the 1850s and 1860s. Scandinavian immigrants had settled bench farms on the east side of Lynne in the 1870s and 1880s. 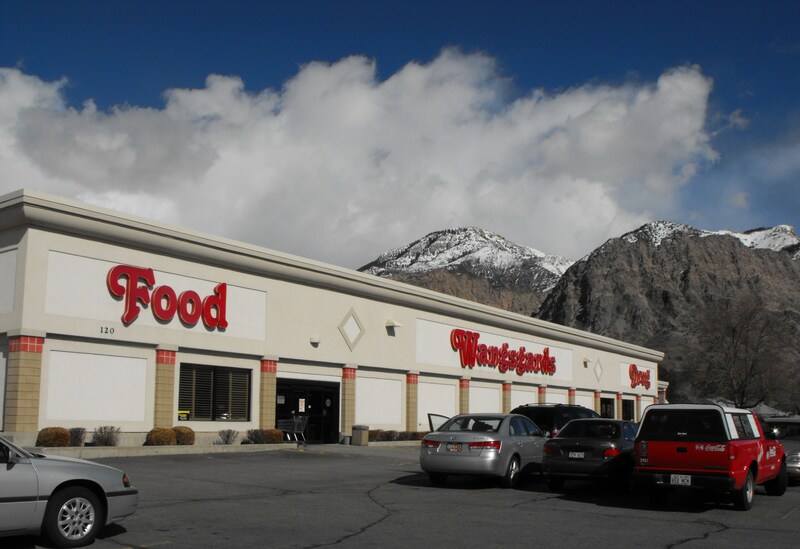 These farms now contributed significantly to Weber County agricultural economics. Stone Farm on west side of Five Points now encompassed the old Bingham Farm ; Chauncey Stone plowing; photo c. 1915. 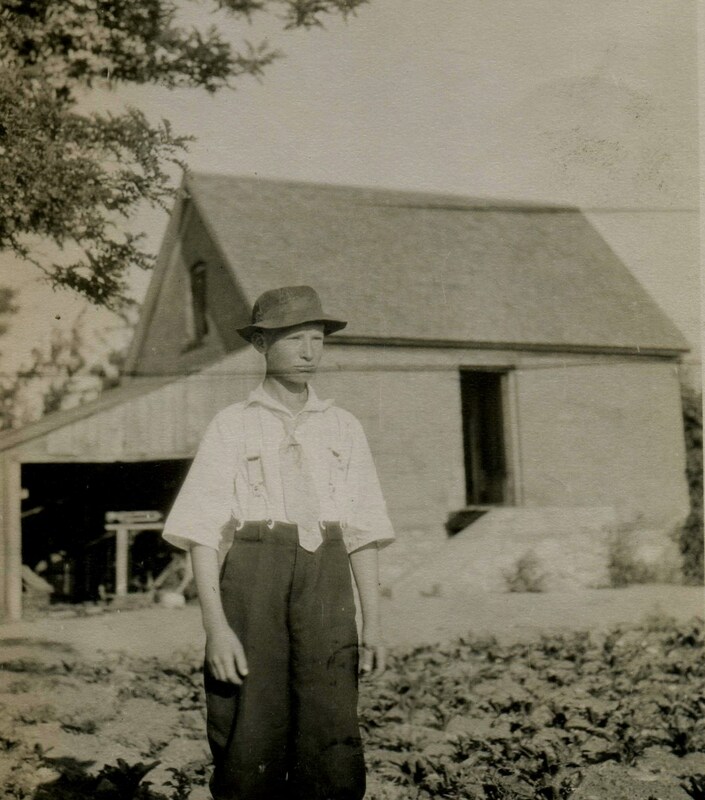 Peter Petersen farm, east side Five Points; photo c. 1916. In the first half of the Twentieth Century it was common for local farmers to use both horses and some gas powered machines on their farms. 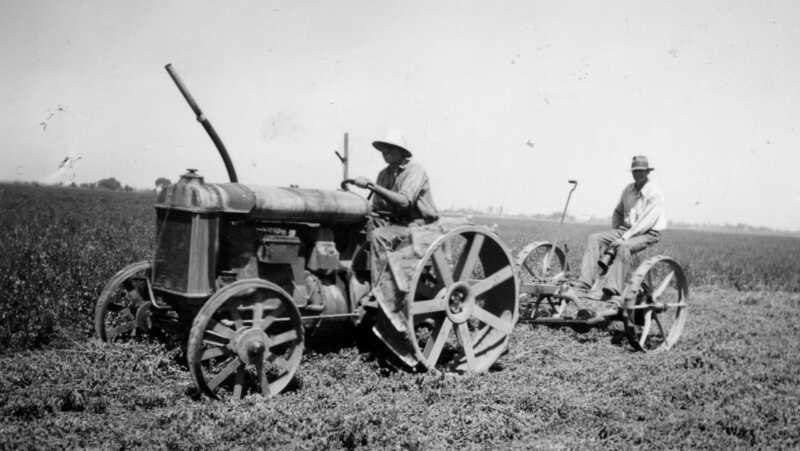 Slowly, year by year, the gas powered tractors and machines improved and became the modern way. 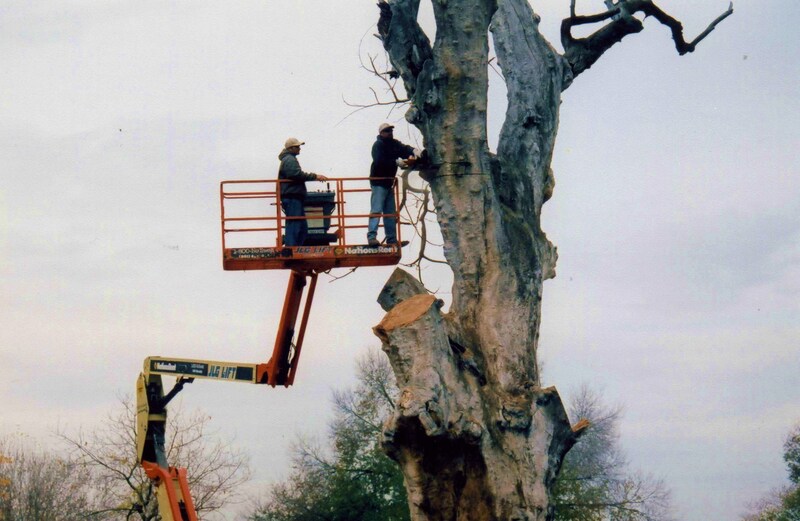 Great Basin Antique Machinery demonstrated a restored gas powered thrasher that typified modern farming in the first half of the Twentieth Century; photo 2002 on Bingham/Stone farm. Warren Stone and Chet Jenkins cutting hay with a Fergeson-Brown Type A tractor, 1936-1937. 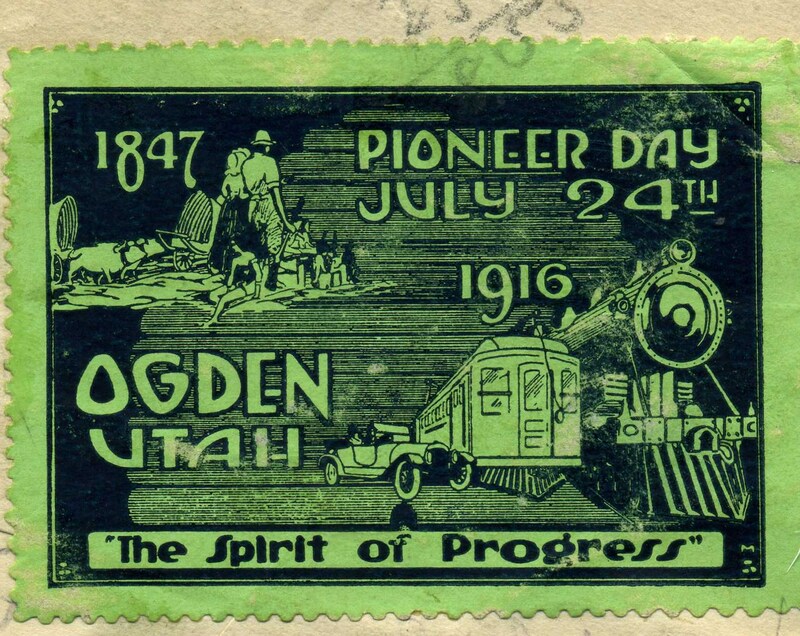 A decorative stamp printed in 1916 for Pioneer Day summarized The Spirit of Progress in Weber County, from pioneers to trains to automobiles. “They were both business men and entrepreneurs and were always in friendly competition. 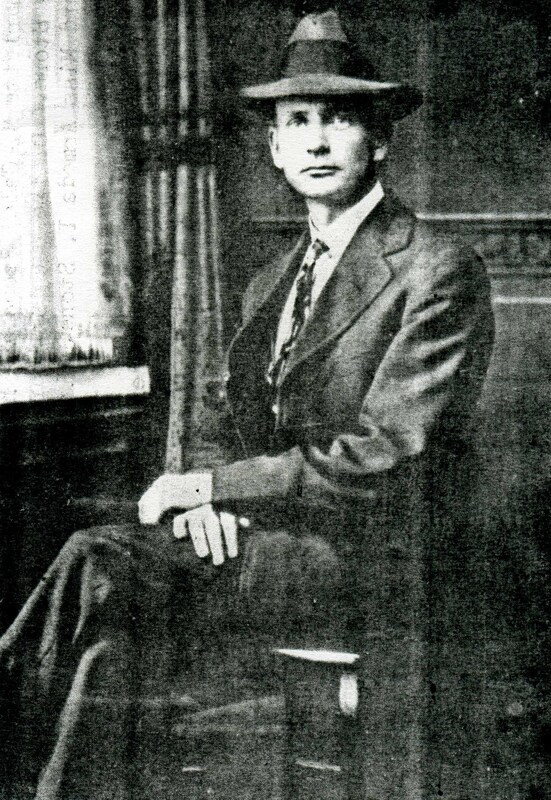 George Eccles, one day, about 1910, bought the first automobile that Ogden ever had. He drove all the way down Washington Ave. to see his friend, George Smuin. 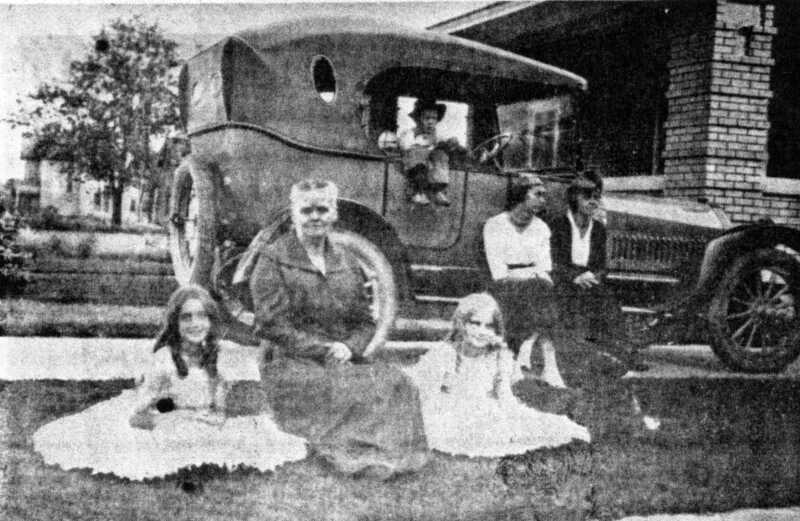 It was on a Sunday, and he had all his family in his brand new automobile, and Geo Smuin saw the Eccles family drive up, and they were all so excited to see this automobile that had come to Ogden. As they sat there and ooohed about the new automobile, George Smuin said, “I have something better that what you’ve got.” And George Eccles couldn’t imagine that anything could be better than an automobile. 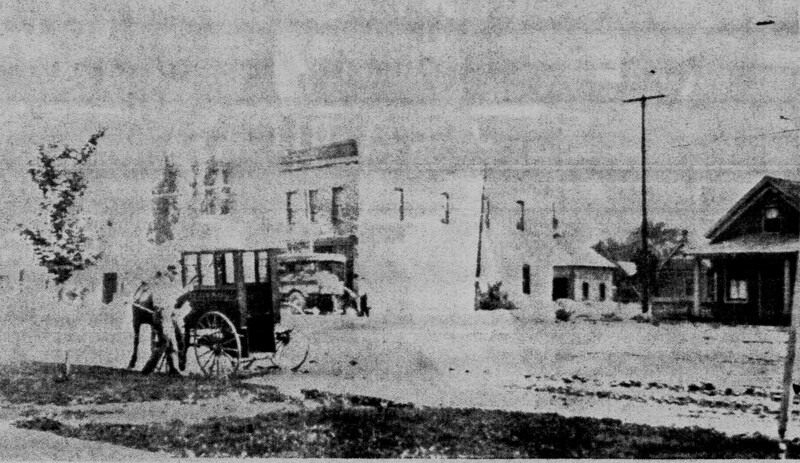 After the coming of automobiles, the “Chinese Wall” was removed, a 6 inch wall on either side of the street car tracks between 2nd St. and 3rd St; now cars could pass over the tracks when necessary; photo c. 1920. 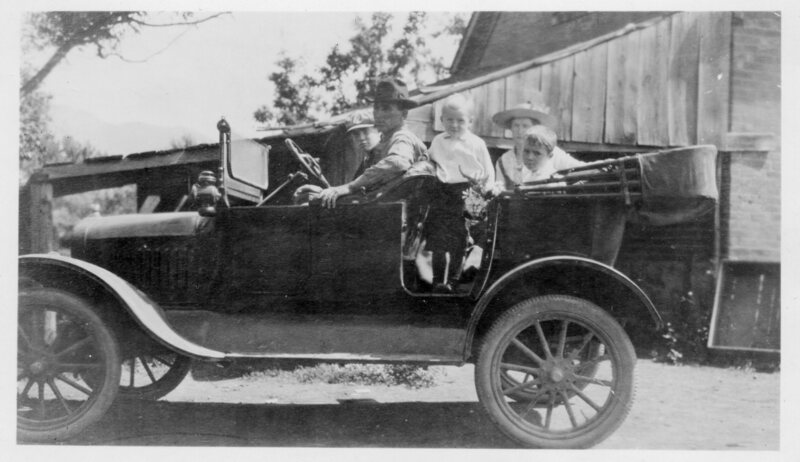 Chauncey & Edna Stone in “Our first car“; c. 1917. James Allen and son Jimmy with car at Five Points. 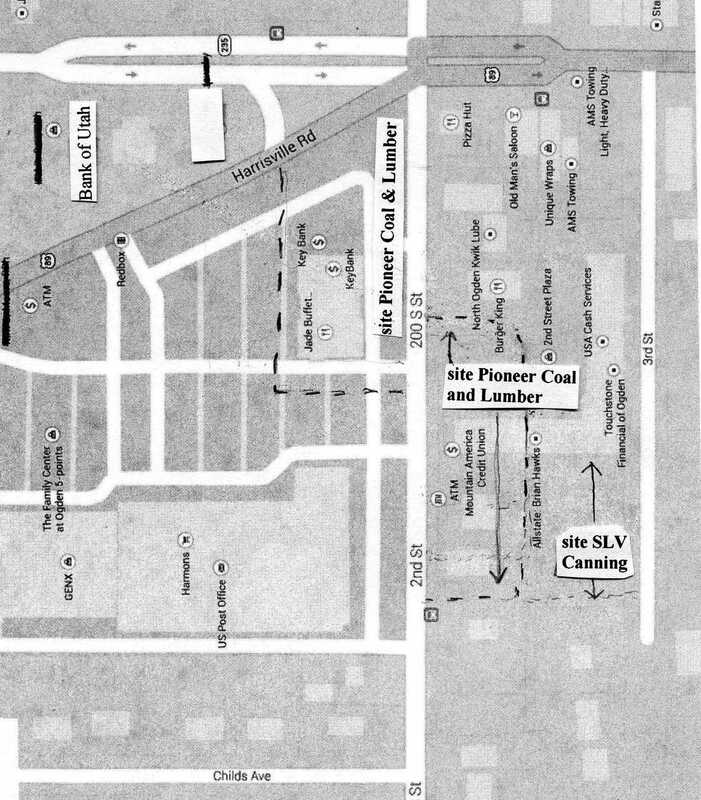 The Salt Lake Valley Canning Company and Pioneer Coal and Lumber were built along side of the Oregon Short Line on the south side of 2nd Street (see map below) where Mountain America Credit Union, Butters Machine, and the 2nd Street Plaza are located in 2015. The Pioneer Coal and Lumber company was started by the Randall family. Gradually the company expanded and moved the office and lumber business to the NW corner of 2nd St and the Harrisville road extending into the area that is Key Bank in 2015; the coal business remained on the south side of 2nd St. in the original location. TODAY: Sites of Pioneer Coal and Lumber and SLV Canning (later Superior Honey). 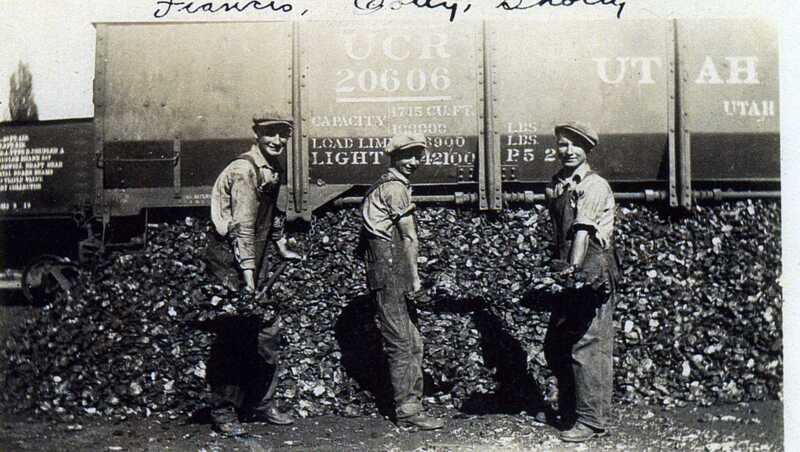 Pioneer Coal and Lumber; Francis, Cotty and Shorty Sully at work; photo c. 1930. 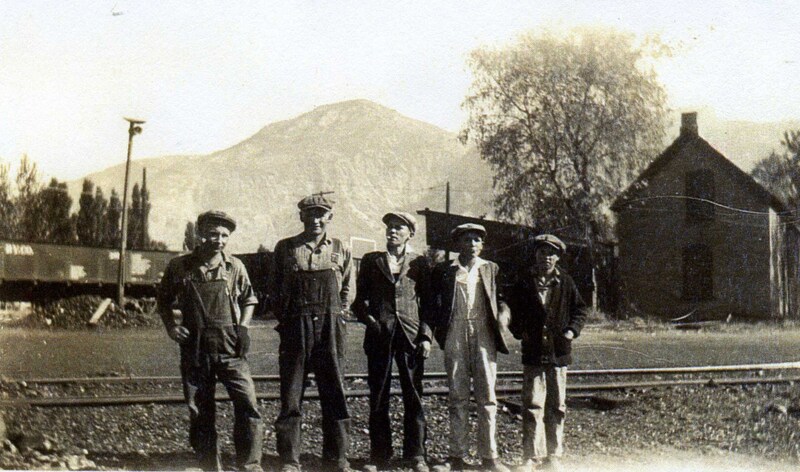 Pioneer Coal & Lumber; Cotty & Francis Sully and 3 friends; photo Myrtle Gamble, c. 1930. Pioneer Coal and Lumber expanded to the N. side of 2nd St. and built an office on the NW corner of 2nd St and Harrisville Rd., facing Harrisville Rd. 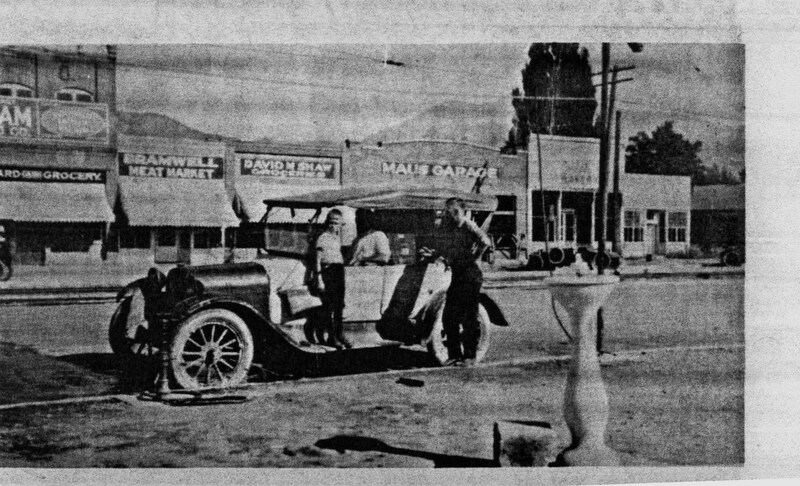 ; photo Standard Examiner c. 1930. Pioneer Coal & Lumber office on NW corner of 2nd and Harrisville Rd. 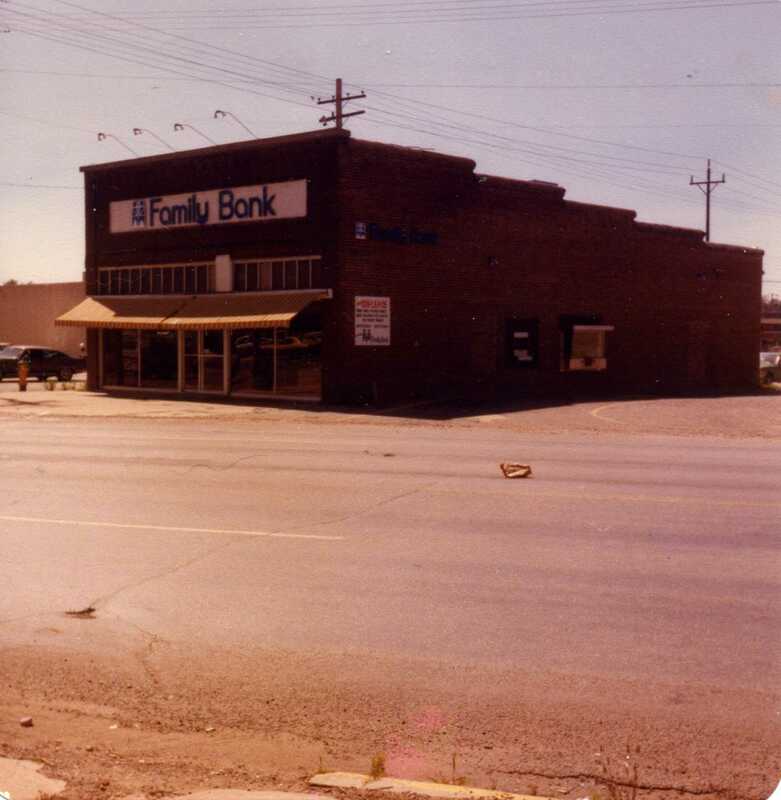 in 1977 when used as a bank; photo G. Sherner. 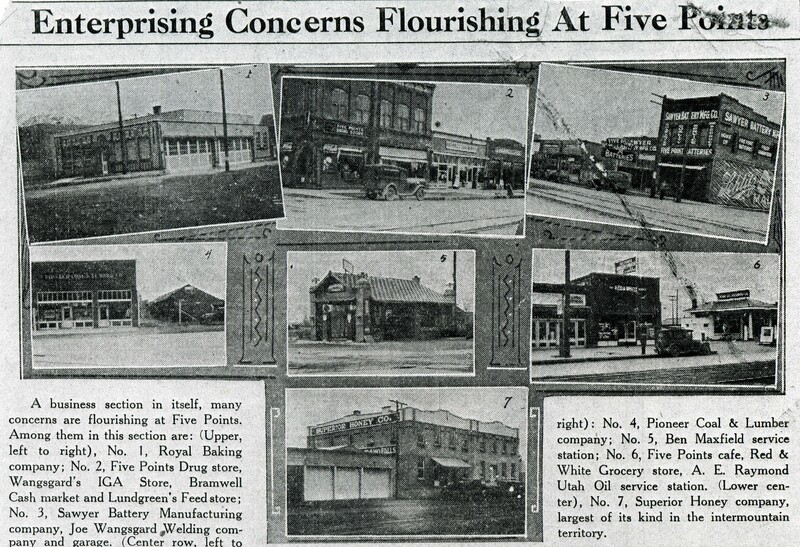 (L to R): 1.Royal Baking Co.; 2.Five Points Drug Store, Wangsgards IGA Store, Bamwell Cash market and Lundgreen’s Feed store; 3. Sawyer Battery Manufacturing company, Joe Wangsgad Welding company and garage; 4. Pioneer Coal & Lumber company office; 5. Ben Maxfield service station; 6. 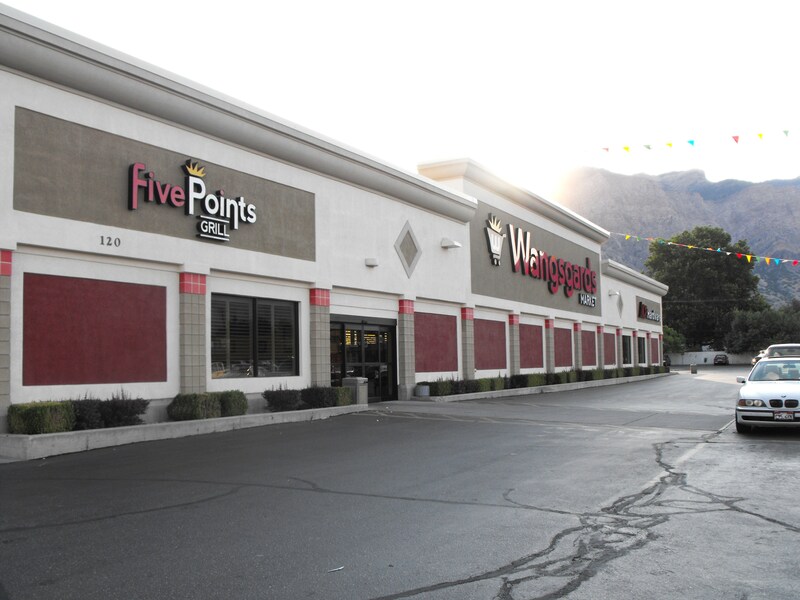 Five Points cafe, Red & White Grocery store, A. E. Raymond Utah Oil service station 7. Superior Honey company, largest of its kind in the inter mountain territory. 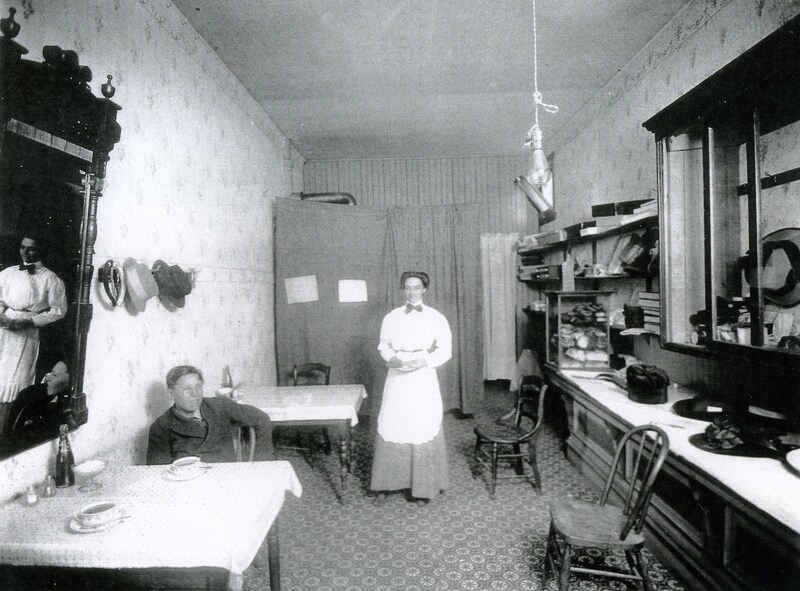 Maggie Iverson Harrop’s store sold meals and hats near Washington & 3rd. ; photo courtesy Jerry Harrop. YESTERDAY – Streeper Hall on NE corner of Washington Blvd. 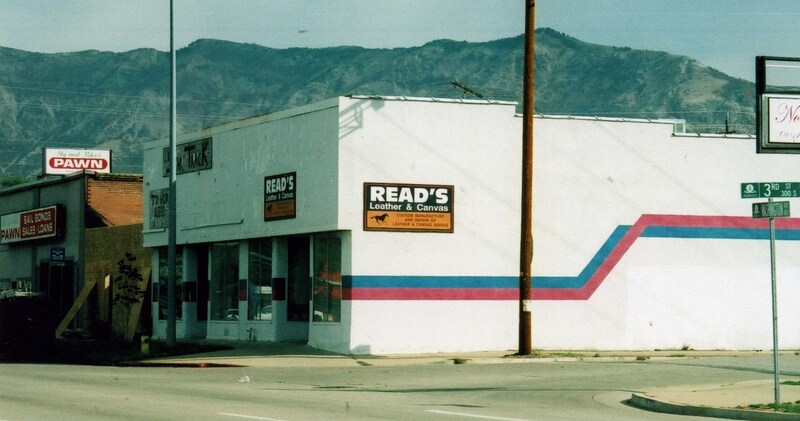 and 3rd St. was home to the Automatic Controller and Universal Spot Welder; TODAY Reed’s Leather & Canvass Shop is located here. 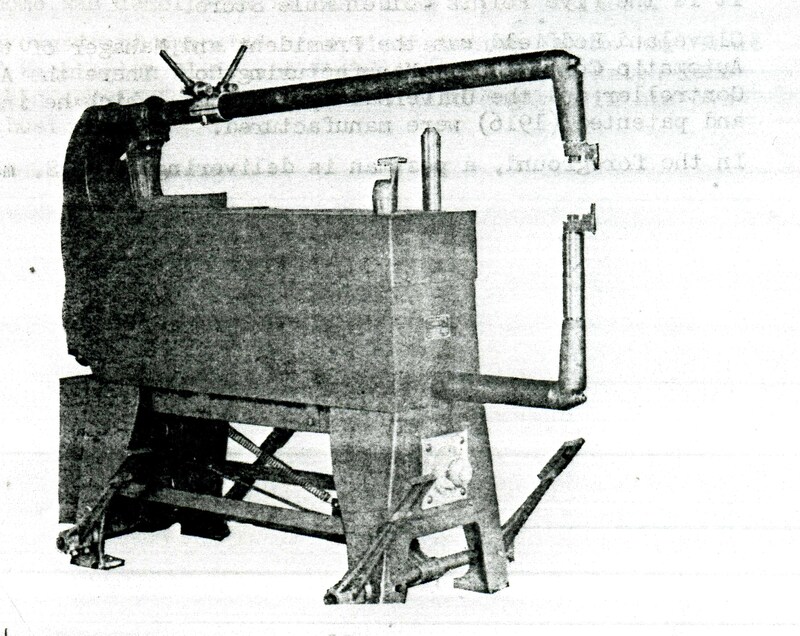 Universal Spot Welder, invented and manufactured by Cleveland Redfield. 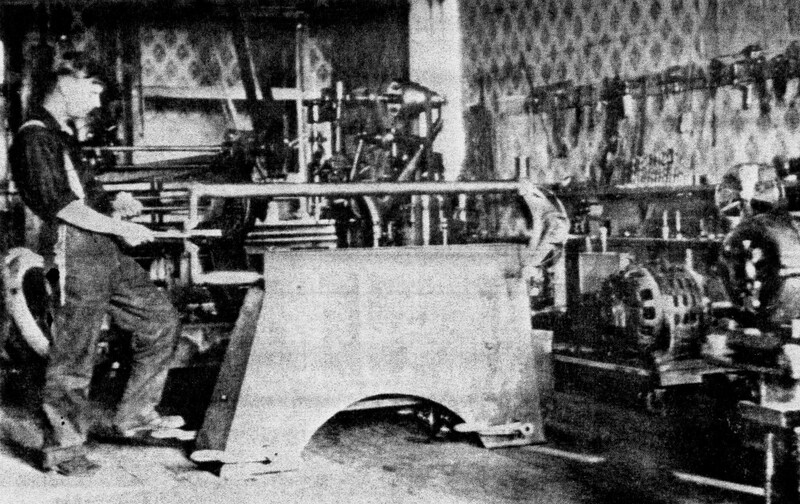 Interior of Streeper Hall where Redfield located the Automatic Controller & Manufacturing Co.;Oral A. Browning, Cleveland’s uncle, is using the Universal Spot Welder; photo c. 1920. Another picture of Streeper Hall; today’s Reed Leather & Canvas Shop located here; adjoining it is the Five Points Golden Rule store; mailman in the foreground. TODAY – Read’s Leather in 2011. Fred Redfield started the honey business in his home about 1900. He kept his own bees and refined the honey on his kitchen stove. In 1910 he moved the business into the Salt Lake Valley Canning Co. building and called it The Superior Honey Company. The company grew, becoming one of the world’s leading producers and distributors of honey and honey-making equipment, but its headquarters remained in Five Points. The Ogden plant had the most modern facilities for the sterilization and filtering of beeswax. The company’s main activities of processing and packing honey expanded to include the distribution of a complete line of beekeeping supplies. 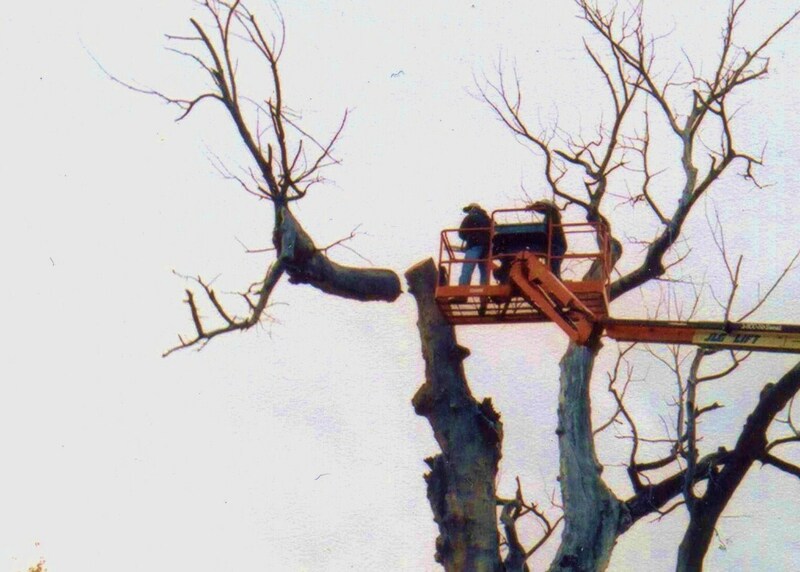 The company produced its own wooden articles, such as hives and frames, and the company developed the Superior Lifetime Honey Extractor, which was manufactured in Ogden and sold to beekeepers all over the world. At the South Gate, California plant, the company had candle manufacturing facilities for producing household, ornamental and church candles. In 1910 Fred Redfield bought the Salt Lake Valley Canning Co. and converted it into The Superior Honey Co; photo 1950s. MAP TODAY: Site of The Superior Honey Company is the same as SLV CAnning on the N. side of 3rd St.
Site of Superior Honey as viewed from 3rd St. in 2015. 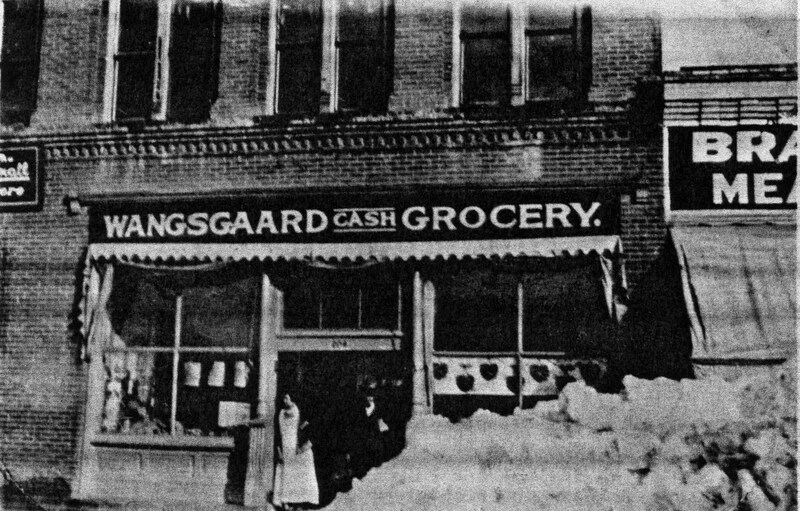 Wangsgard Cash Grocery at 204 Washington Ave. started in 1919 by Peter and Mary Wangsgard. 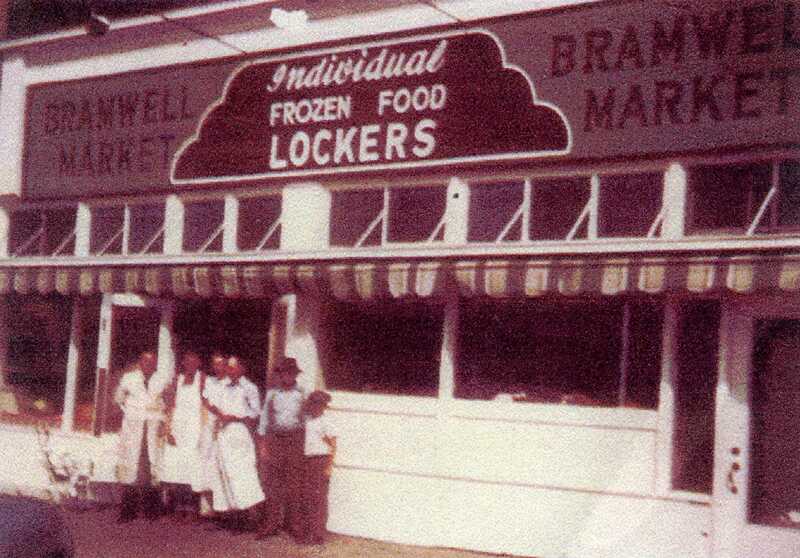 John Bramwell started Bramwell Meat Market started in 1911; his sons Harold and Clarence took charge of the store about 1916. Letter D on far right is for David Shaw Grocery store. 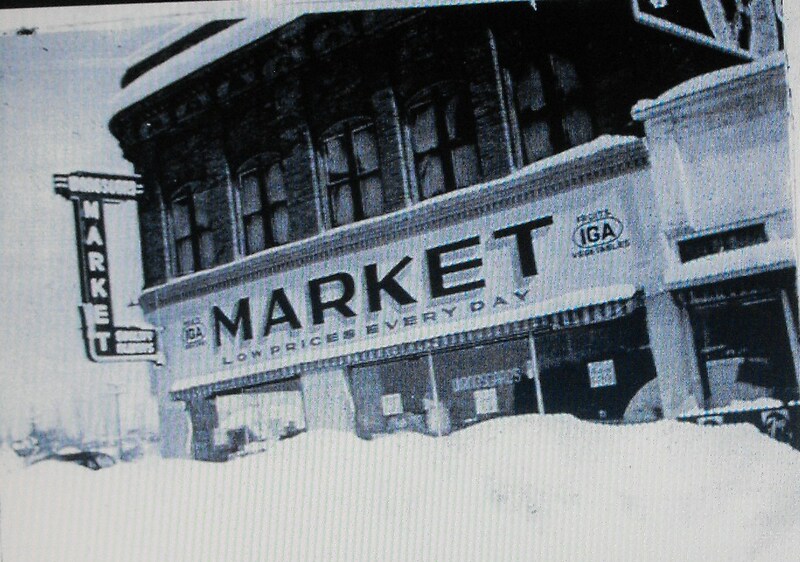 Meat markets were popular at Five Points. 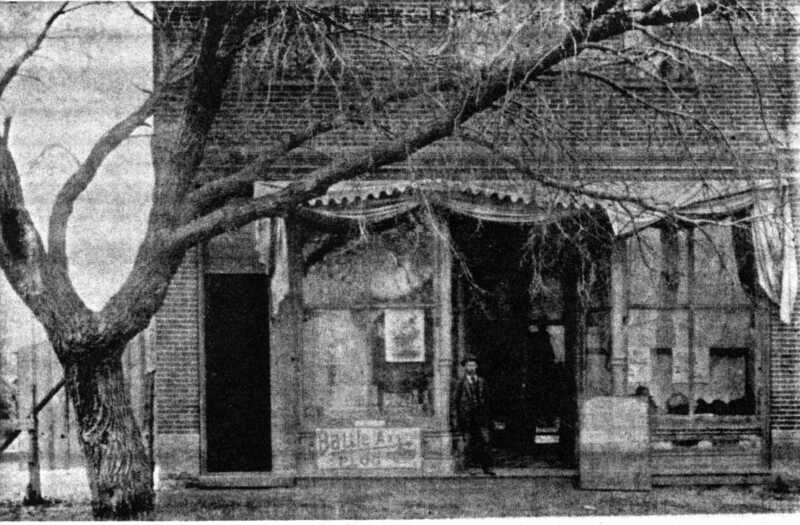 Two of the early meat markets were Harrop Brothers Meat Market, and C. W. Wright Meats – located at 205 Washington Ave in 1906. Peter Petersen was the cutter at C. W. Wright’s. 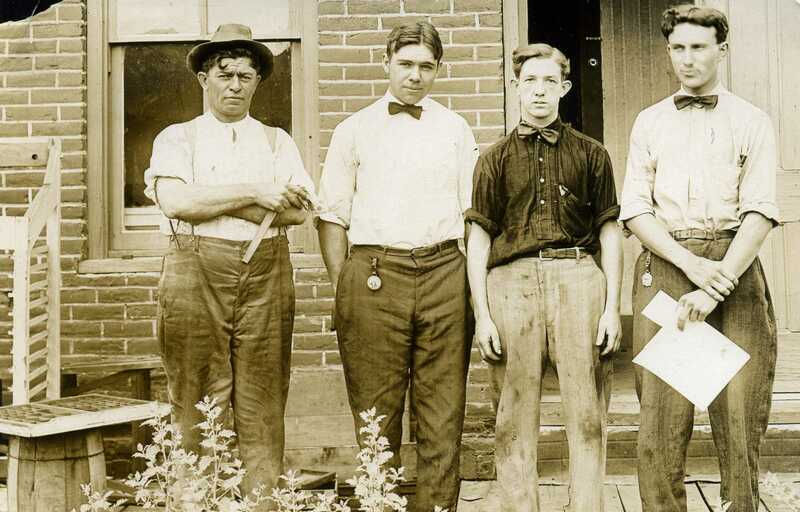 Harold Bramwell’s father bought stock in the Cardon Brother’s Market in about 1909, and Harold, age 15, was given a job there and taught how to cut meat. 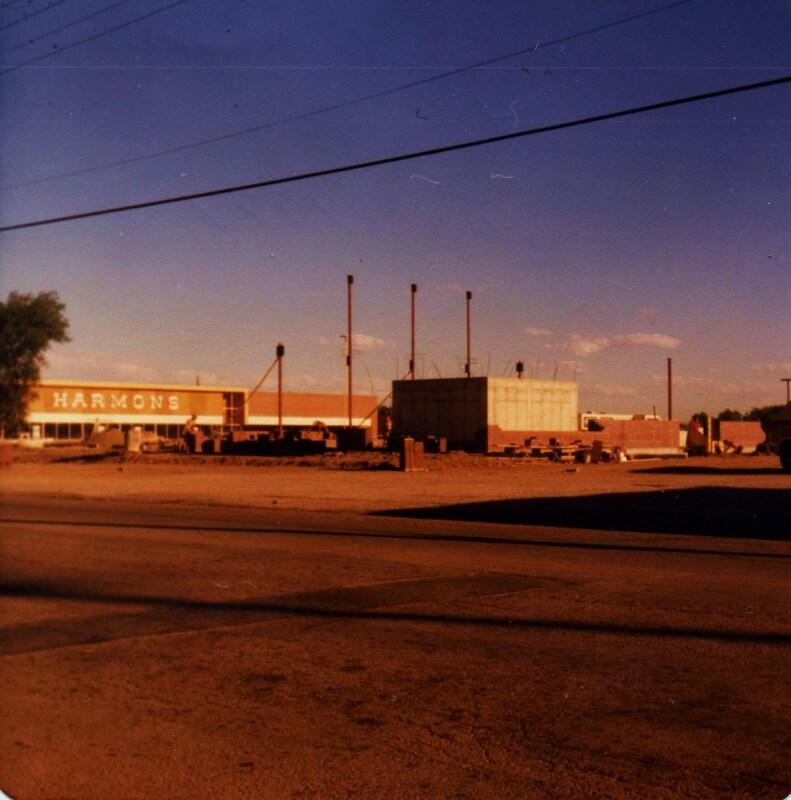 After two years the Cardon Brothers sold the meat market to Harold’s father and the grocery side of their store to David Shaw. 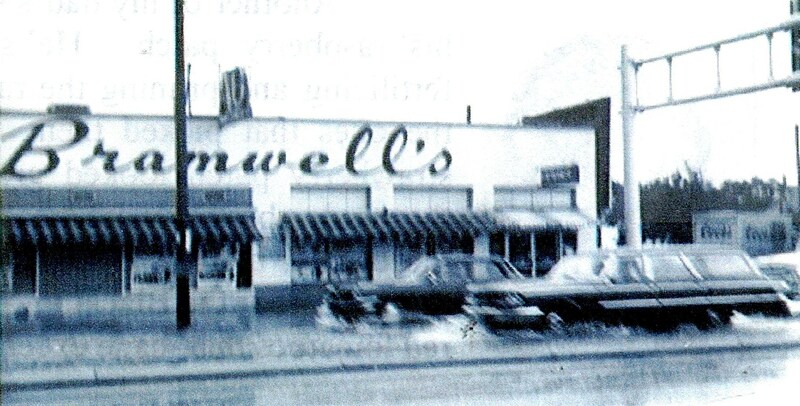 Harold’s father called his new store Bramwell Meat Market. 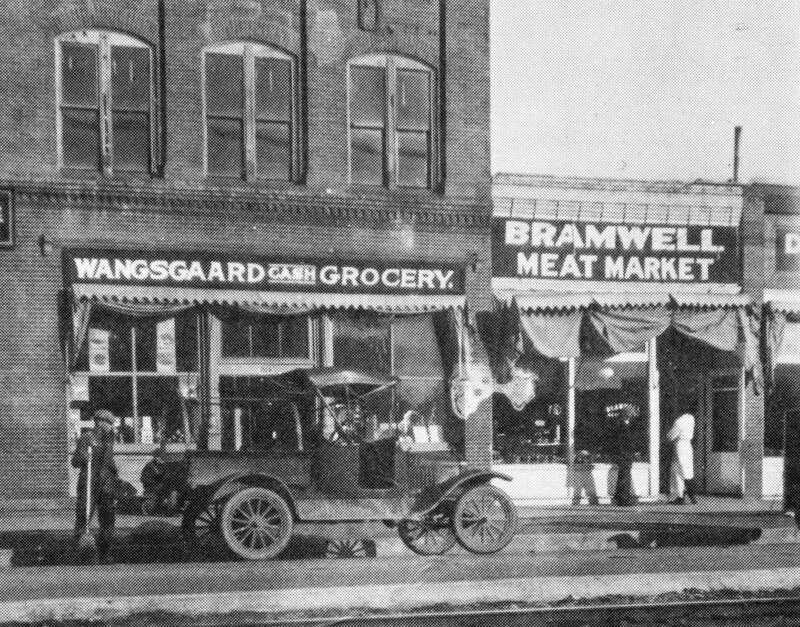 In 1919 Peter and Mary Wangsgard opened Wangsgards Grocery on the north side of Bramwell Meat Market, and the David Shaw Grocery was still located on the south side. 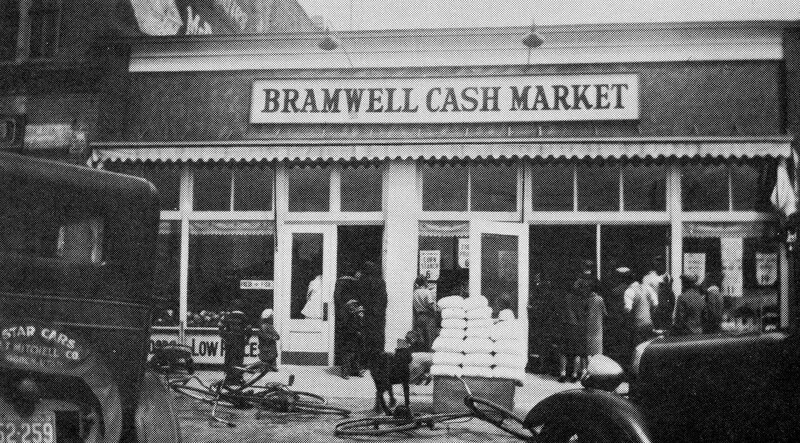 Bramwell Meat Market expanded to Bramwell Cash Market; opening day turned out to be a very busy day; photo 1933. 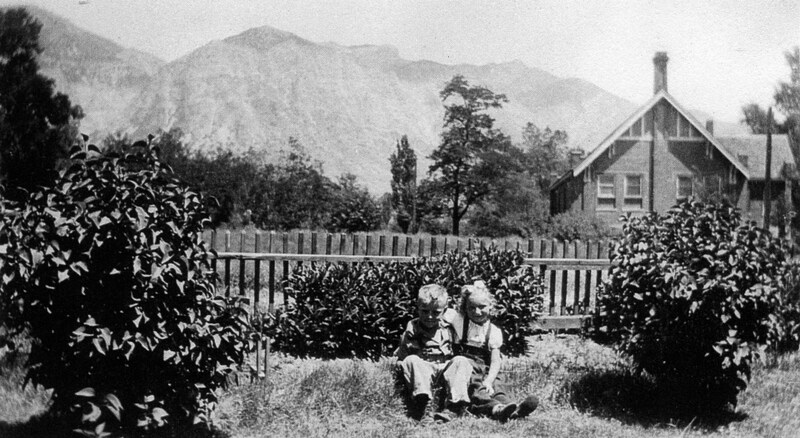 1881 house of Anders and Alice Harrop Anderson, 259 2nd St; Indians marked the fence to show that the family here was kind to Indians; photo Weber County Recorder. 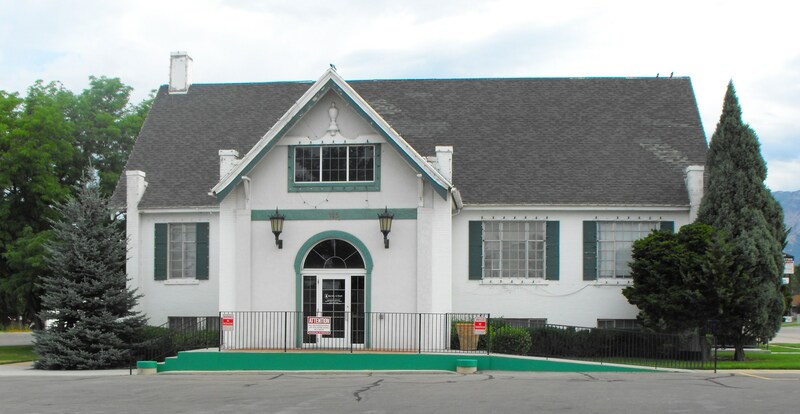 TODAY Anders Anderson house is part of a day care business at 259 2nd St.
Mrs. Sarah Browning Redfield trained and organized the Redfield Dance Orchestra that played for dances at Five Points and at other Weber County sites at the turn of the century. 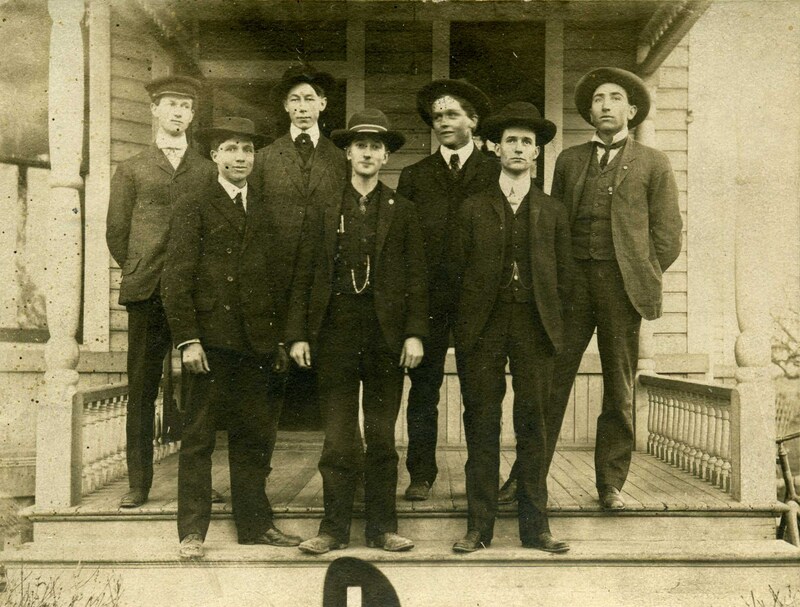 The Redfield Dance Orchestra – Top row: Fred Redfield, Archer Anderson, George Stone, Chauncey Stone. Front row: Arthur Richards, Clyde Redfield, Carl Redfield. Clyde Redfield practicing in the Redfield home. 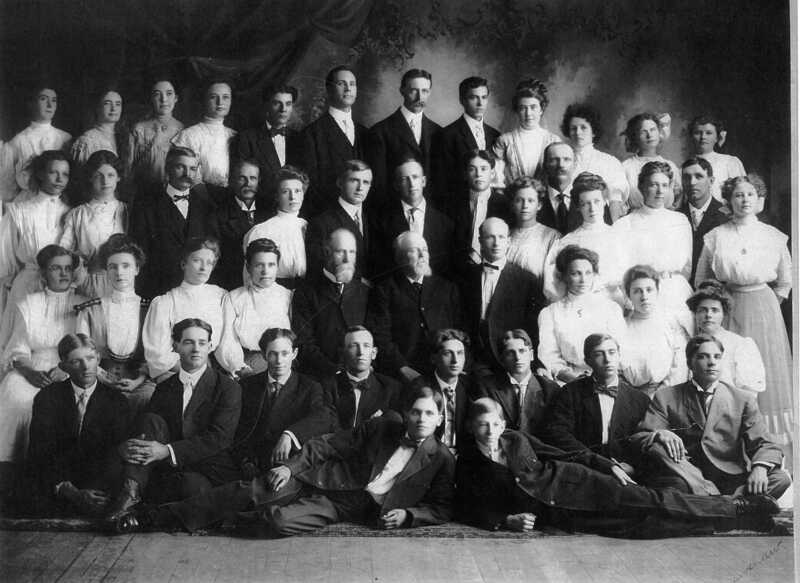 In 1900 there were 503 souls in the Lynne Ward, namely 13 high priests, 17 seventies, 34 elders, 17 teachers, 27 deacons, 279 lay members, 116 children under 8 years of age. George Smuin served as bishop of the Lynne Ward for eighteen years, from 1889 – 1907. Lynne Ward Sunday School c. 1906. Two boys in front: unknown. Row 1: —-,—-,Elbert Drumiller, Walter Crowther, —-,—-,—-, —-. Row 2: —-, Grace Mills, Harriet? Sherner,—-,Rasmus Christofferson, Bishop George Smuin, Carl Turnquist, —-,—-,Lettie Shaw. Row 3: —-,—-,Ole Olson,William D. Shaw, Sherner,Thomas Irvine,Lawrence Sherner,—-,—-,(row shifts down)—-,Sherner,—-,—-,—-. Row 4: unknown (email us if you can identify someone, binghamsfort@gmail.com). YESTERDAY – the second floor of W. H.Streeper Hall on NE corner of Washington Blvd. and 3rd St. was the temporary meetinghouse for Ogden 8th Ward; lower level was for the Redfield Spot Welder. TODAY – Streeper Hall is Read’s Leather in 2011. The rear of Read’s Leather reveals old brick where the stucco fell away. YESTERDAY -new red brick Lynne Ward built in 1914; the name of the ward was changed to Ogden 15th Ward in 1923; photo G. Sherner. TODAY – Bank of Utah; photo 2004. By 1916 the community and ward members were suffering from sorrows of death and deformity from World War 1. 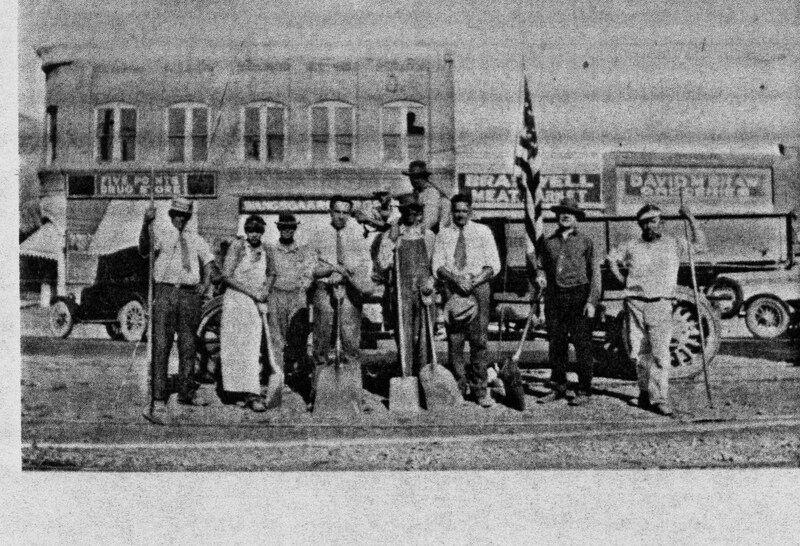 Those who returned after the Armistice in 1918 faced a lack of work – Utah’s agrarian economy did not support many jobs. Signing of the Armistice was celebrated by tying cans to this car owned by Cleveland Redfield and driving jubilantly up and down Washington Ave.
About this time the world flu epidemic came unbidden to Five Points, and nearly every family lost a family member to its scourge. Then prohibition became a political issue, and there was growing awareness of the erratic stock market. 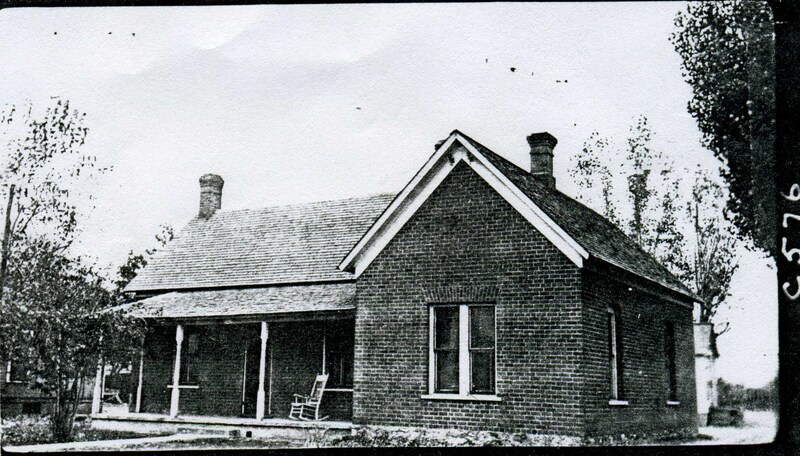 The men in the bishopric of the Lynne Ward were devoted servants to the community during these difficult times, and the new meetinghouse at Five Points was a real bright spot for the Mormons and many non Mormons too. 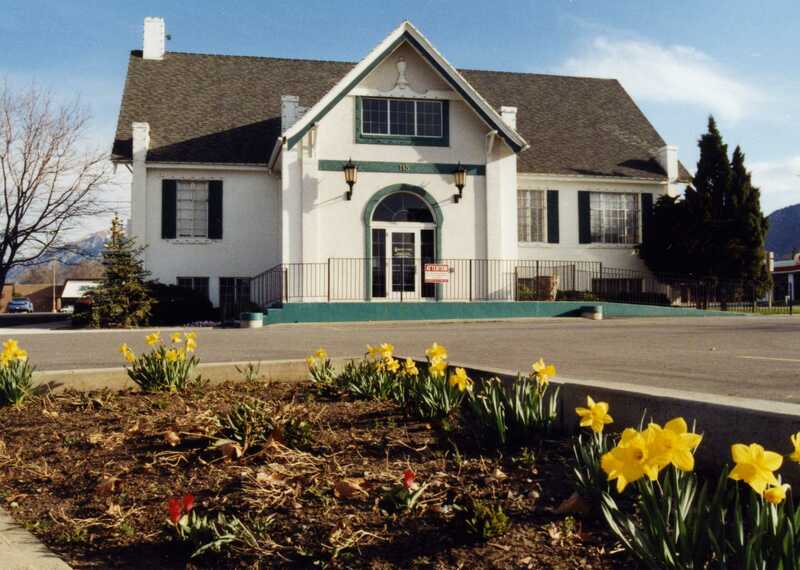 It was a spacious building, well designed, located on the triangle next to Smoot Park. Ward meetings, interviews and social events were held here. Everyone was proud of the chapel. In 1923 the name of the ward was changed from Lynne Ward to the Ogden 15th Ward of the Church of Jesus Christ of Latter-day Saints. Children sitting in back yard of their house located in today’s parking lot of Harmons; Lynne/ Ogden 15th Ward chapel in the background; photo courtesy Myrtle Gamble, 1944. 8TH WARD NEW CHURCH AT 7TH ST. AND ADAMS AVE. YESTERDAY: 8th Ward building once stood on NW corner of 7th & Adams Ave. In March 1914 the 8th ward presented this delicate cane as a gift to Mary Bjorklund. 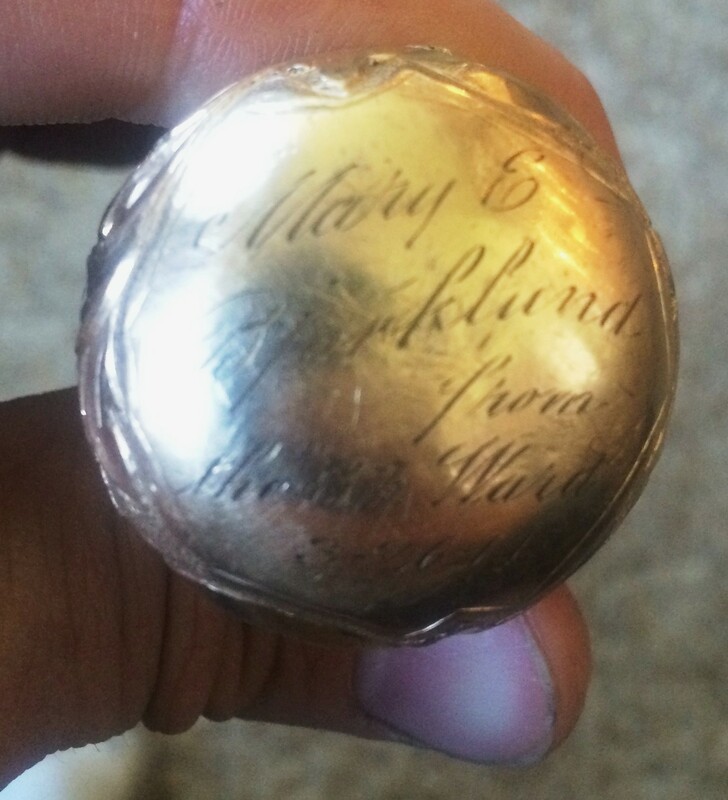 Inscribed: Mary E Bjorklund, from 8th Ward, 3-26-14; photos courtesy Josh Morrell. In 1926 the 1891 Five Points School had a furnace but no lights or indoor plumbing. Students were still using water closets located north west of the main school. 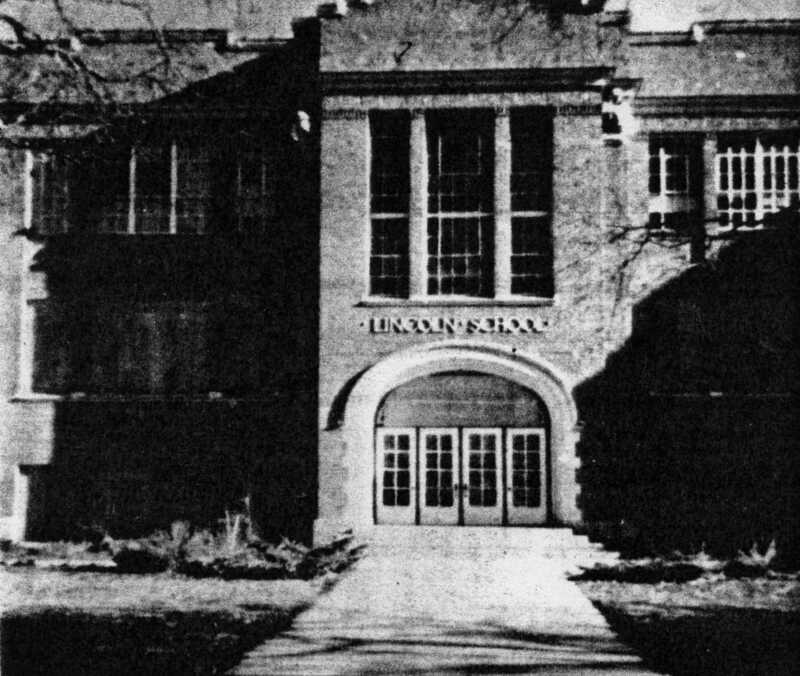 In about 1926 the school district updated the old building, added a large addition, and renamed the newly enlarged building Lincoln School. New addition to the old Five Points school was renamed Lincoln School. 1972 DEMOLITION photo shows the 1890s Five Pts. School and 1920s Lincoln addition on the left. YESTERDAY: 314 Washington Ave., owned by Cleveland Redfield and Carl Redfield. Bicycle Repair Shop owned by their brother, Clyde Redfield; photo c. 1942. TODAY: Dragon Restaurant, 303 Washington Blvd. and Kent’s Sports Store, 307 Washington Blvd. ; photo Nov. 2011. Cleveland purchased the property above in 1942. 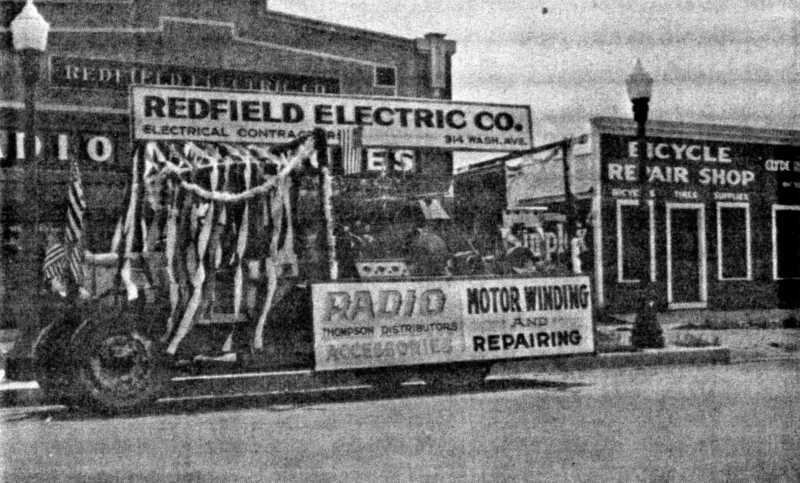 Cleveland’s son W. Byron Redfield was a partner in the business and was working there at the time of his father’s death on Nov. 16, 1956. 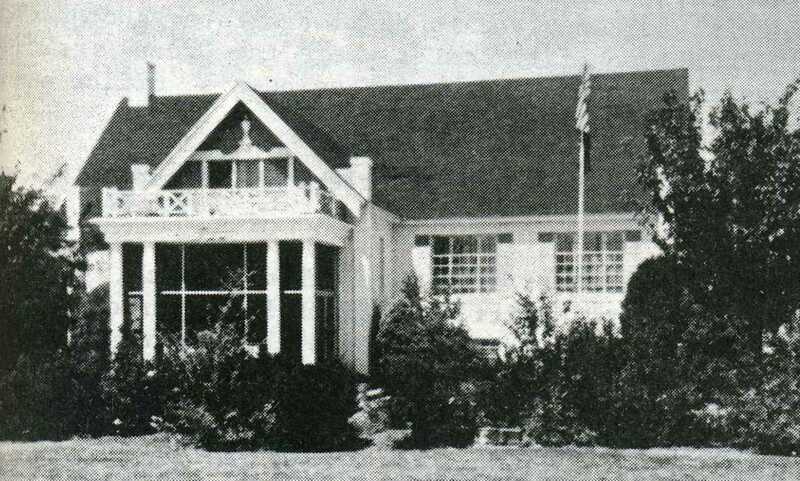 The property was subsequently sold to Roy Morris, then to Clarence Cole, who built the Four Leaf Clover Restaurant. In 2015 the Dragon Restaurant and Kent’s Sport Store are in the location of the old Redfield stores. 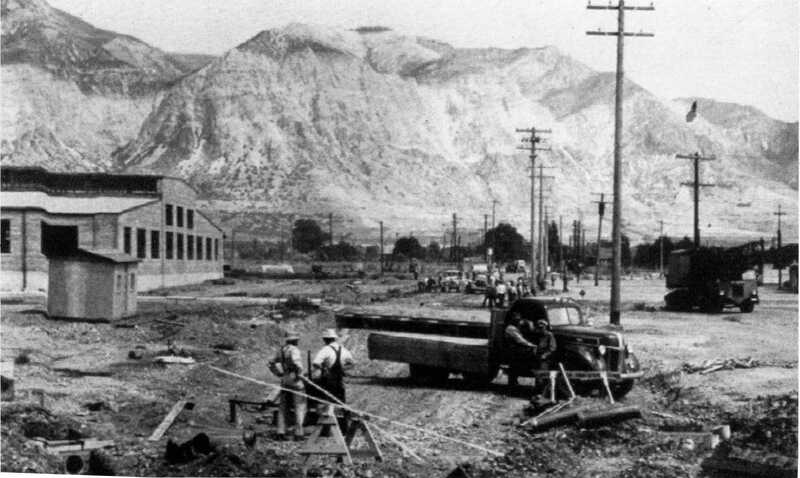 On September 27, 1940, the farms on 2nd Street west of the rail road tracks and east of 1200 West were purchased for the Utah General Depot. 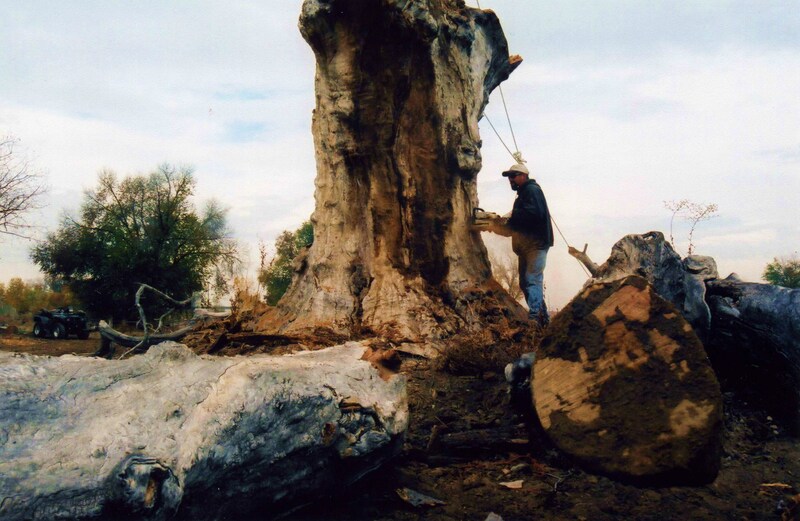 This shocking change deleted 1,678 acres of farmland. Homes, cabins, barns and sheds had to be moved off the site. To the east of the new depot the construction workers made an excavation pit on the old Sam Gates farm to obtain fill dirt to level the land for the construction of the depot, and they drained Stone’s Pond. 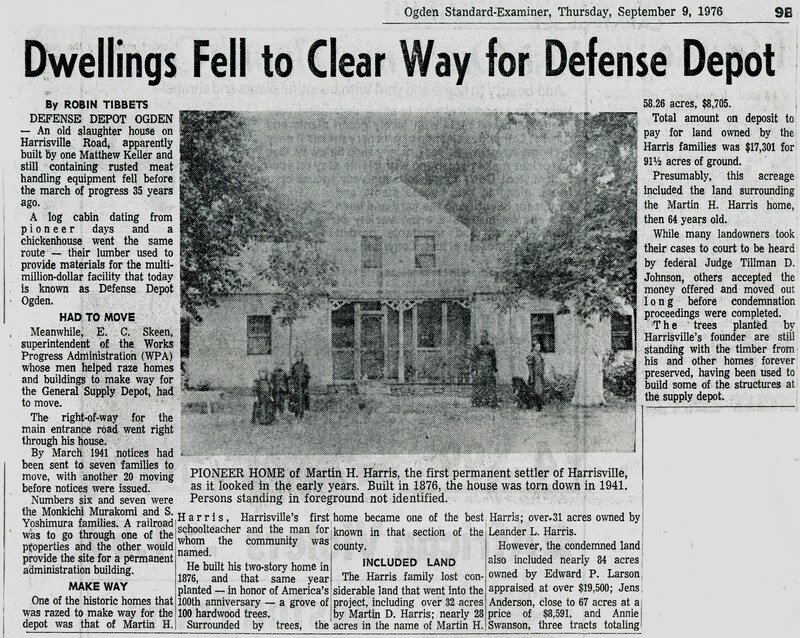 Pioneer homes along W. 2nd Street fell to clear way for the Defense Depot. Early construction of the DDO; photo c. 1941. 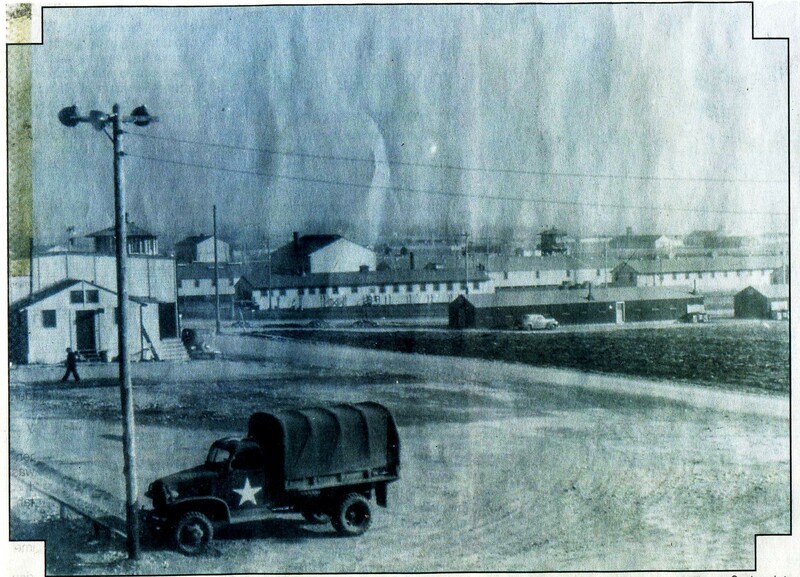 The Defense Depot was used to store and ship food, clothing, textiles, packages, petroleum products, pesticides, pressurized gasses, and general medical, industrial, construction and electronic supplies. Workers stay busy in Defense Depot (left) and singer entertains crowd at the 80th ISU Company Christmas party at DDO (right. 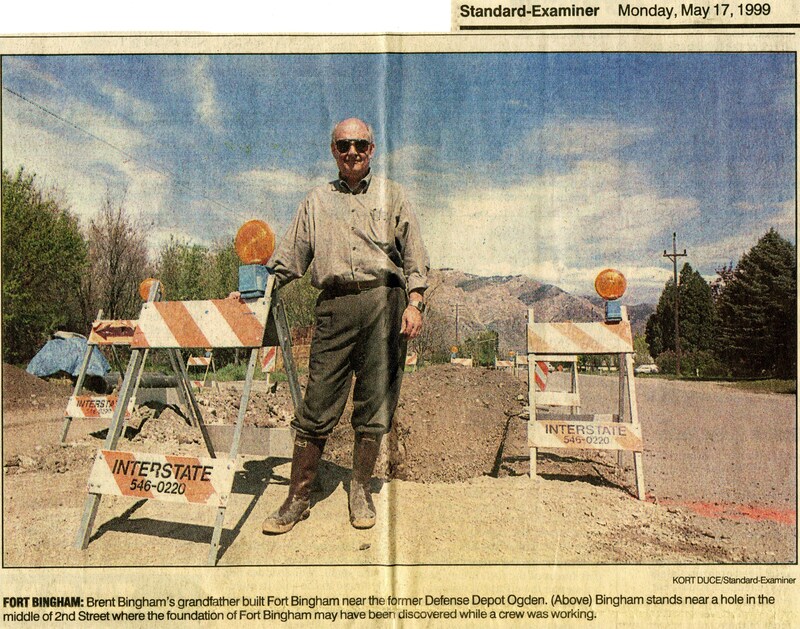 ); photos Standard Examiner 27 June 2010. 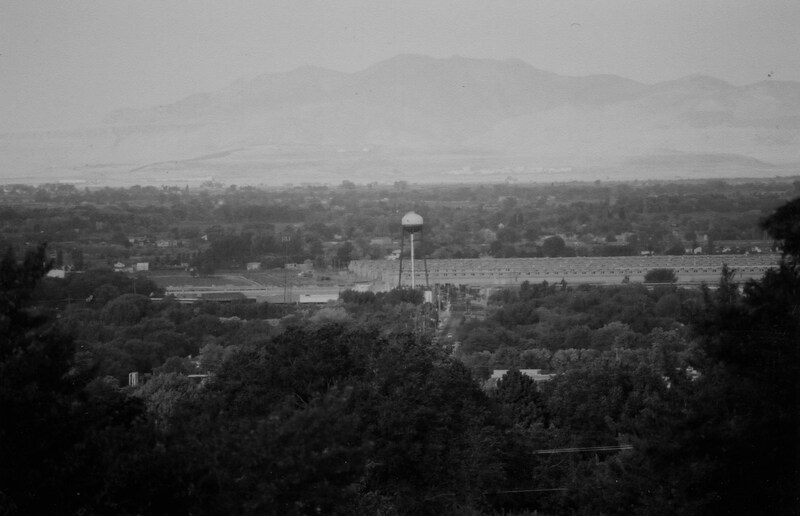 The Utah General Depot housed Utah’s largest World War ll prisoner camp. 4,700 Italian and German prisoners of war were incarcerated here. 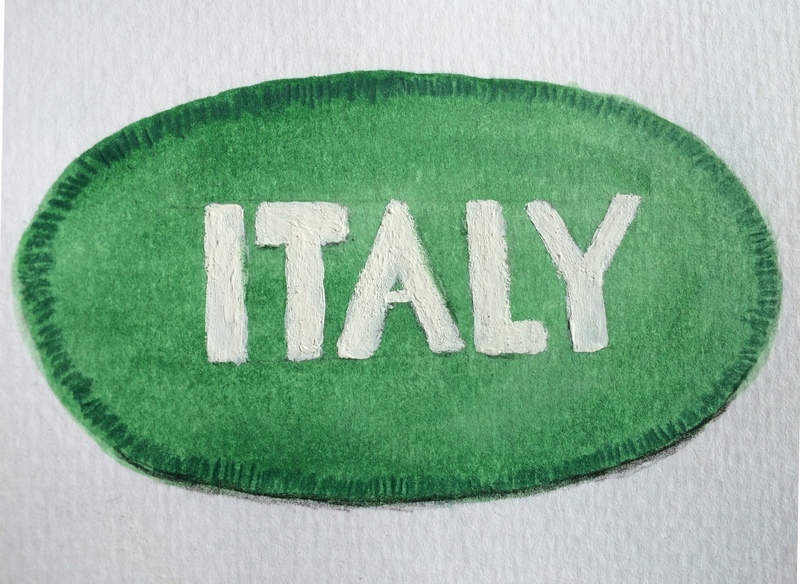 It was the only one in the country in which German and Italian prisoners worked side-by-side. Many features, such as drainage culverts were constructed by these prisoners. Under the the watch of guards, the prisoners also worked as farm hands on local farms. 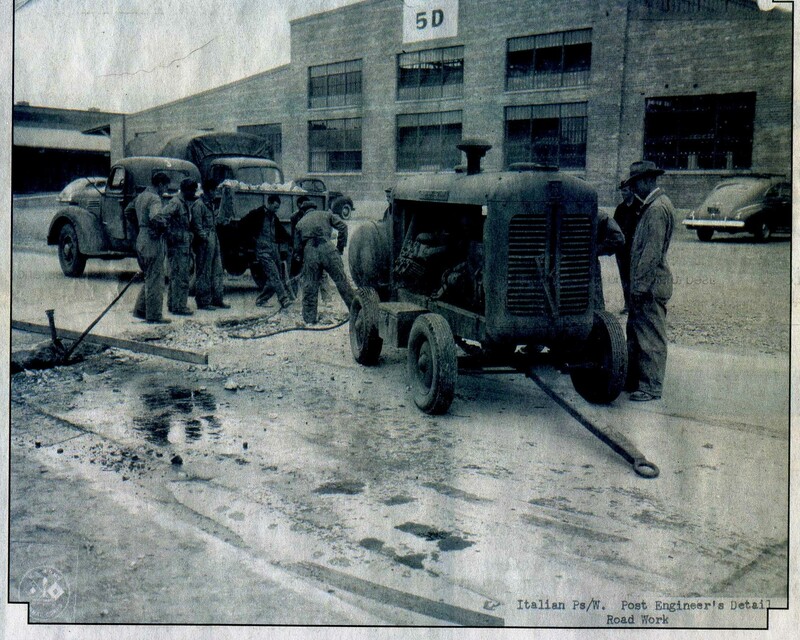 WWll Italian POWs work in the depot. TODAY: Granary at 317 W. 2nd St. Painted image of the patch found in the barn during WW ll; painting by Donna Montgomery Hill. TODAY:The Montgomery Barn, refuge of Italian prisoners, is listed on the National Register of Historic Places; photo 2009. A second generation member of the Sully family returned from California for a visit and wrote these sentimental words on her photograph; photo courtesy Myrtle Gamble. 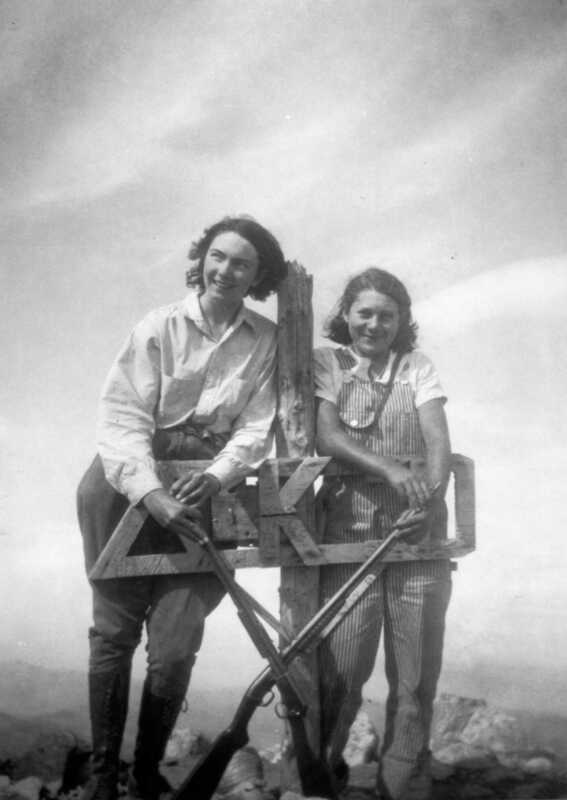 Made it to the top of Ben Lomond Peak by horse; Maxine Stone and Nellie Reno; photo courtesy David Montgomery c. 1940. Water tower at Utah General Depot constructed in the 1940s; photo 2006. Wangsgards grocery moved to the first floor of the Southwell building on the SE corner of 2nd and Washington Blvd. 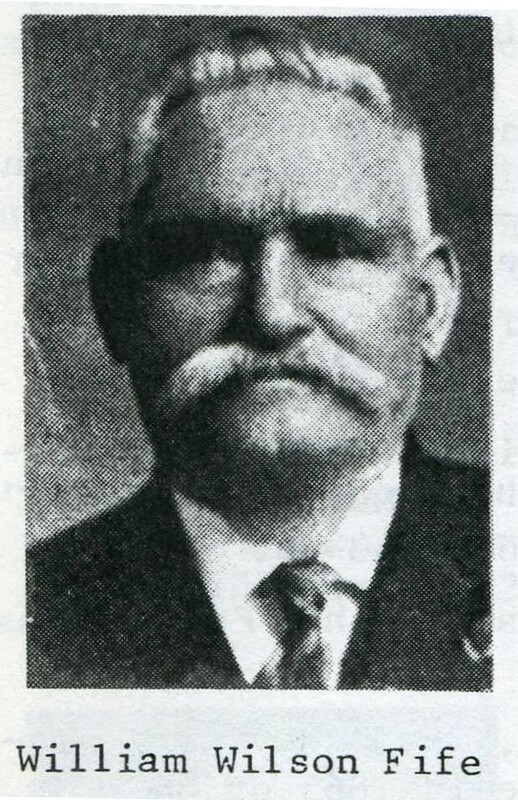 in about 1945. Five Points and mountains c. 1949; in the 1940s children followed a pathway starting at the white fence, going past Royal Baking Co. center rear, and on to Lincoln School; photo courtesy Chrissy Orrell. Bell Bakery on NE corner of Washington Blvd. & 7th St; photo c. 1949. 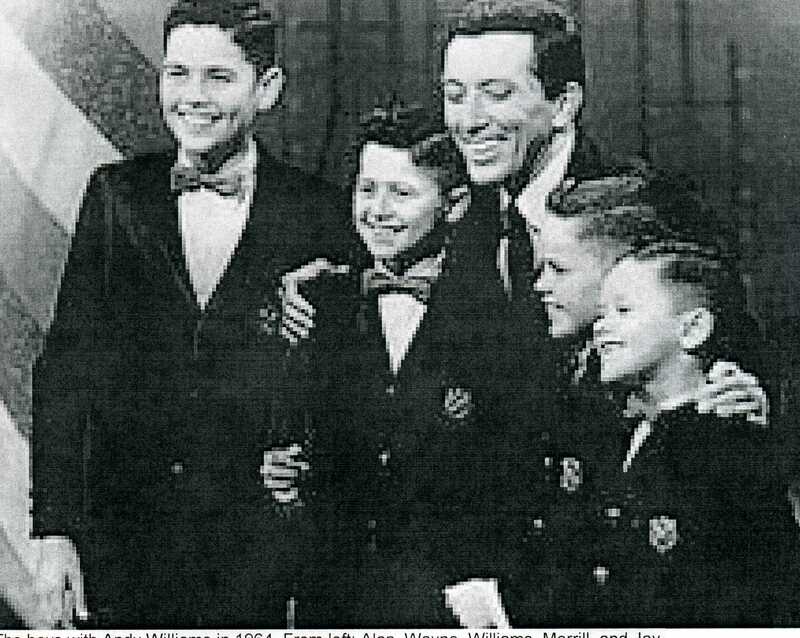 Osmonds: Alan, Jay, Andy Williams, Merrill, and Jay. They started by singing for local wards and audiences. Bramwell Market on E. side of Washington Blvd. between 2nd and 3rd; photo c. 1945. 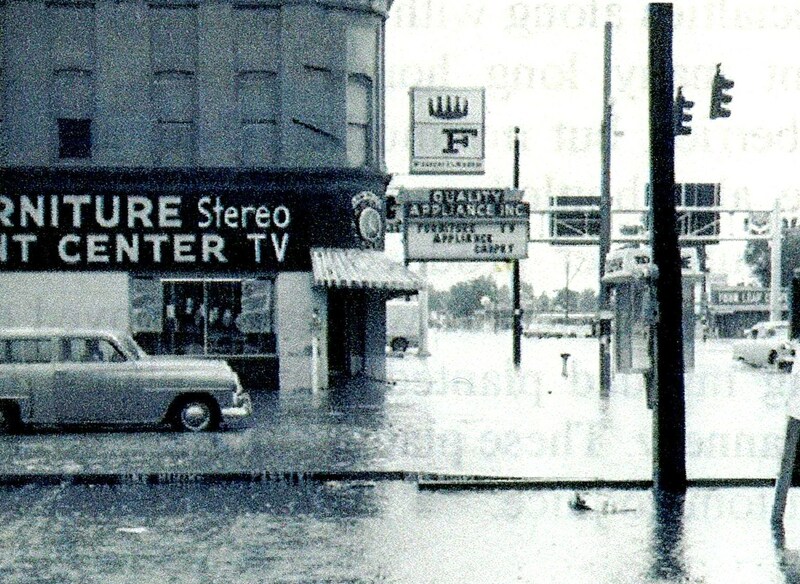 Old Five Point Drug (Southwell Building) c. 1955; rainstorms always flooded the Five Points intersection. 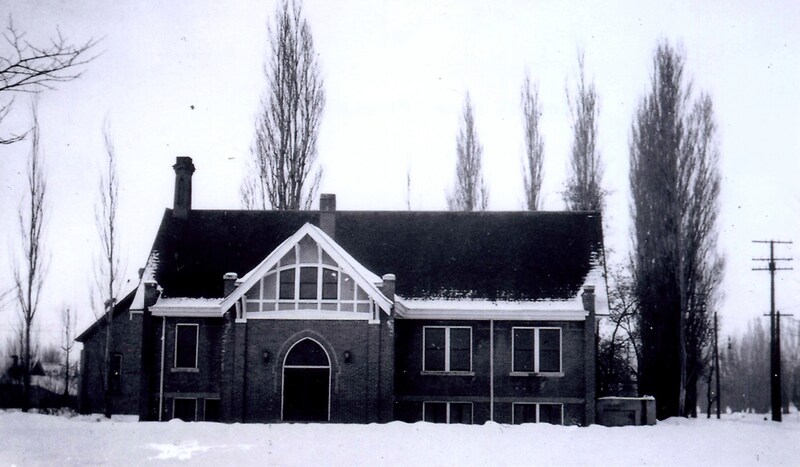 The Lincoln School was abandoned for a new elementary school that was built on Grant Ave in 1953. 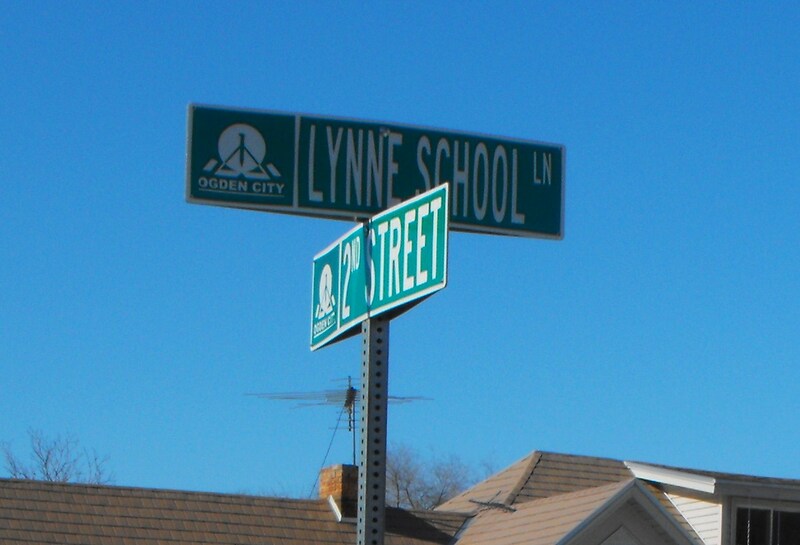 This new school was named Lynne School (6th school, 3rd one named Lynne) and was located on Grant Avenue between 4th and 7th Street. 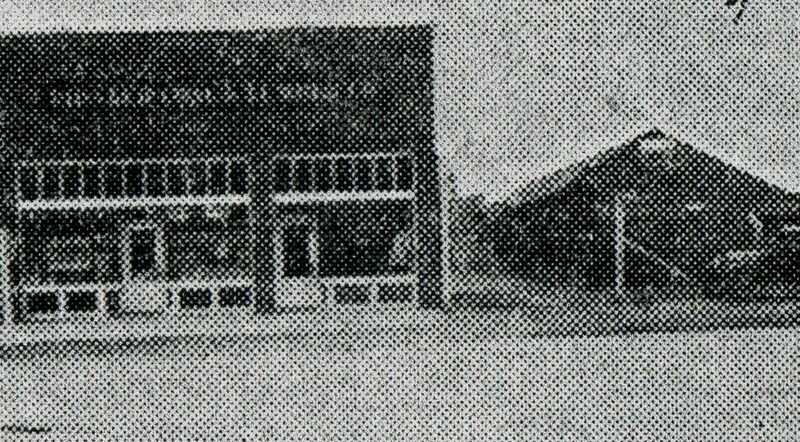 In 1959 Wangsgards grocery store enlarged and built a new store on the NE corner at the intersection of Five Points. The 6th school building and the 3rd one named Lynne School; built in 1953. Wangsgards moved from SE corner to NE corner of Washington Blvd. and 2nd Street in 1959. 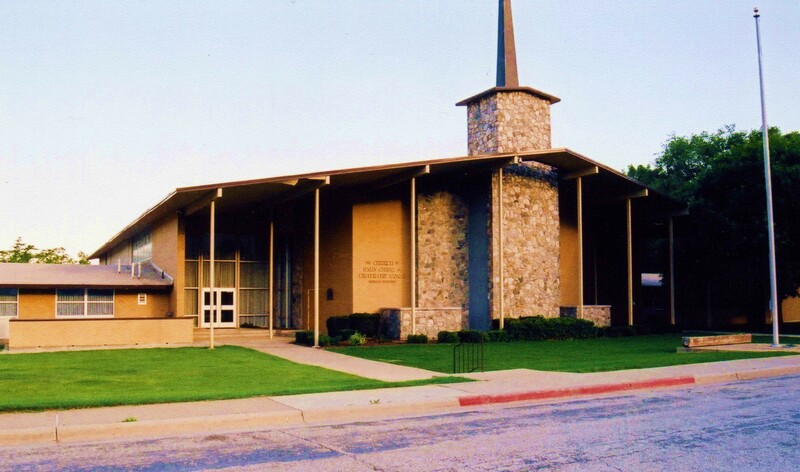 In 1962 the Ogden 15th Ward was 111 years old, and the new ward and stake center at 113 Childs Avenue was completed. 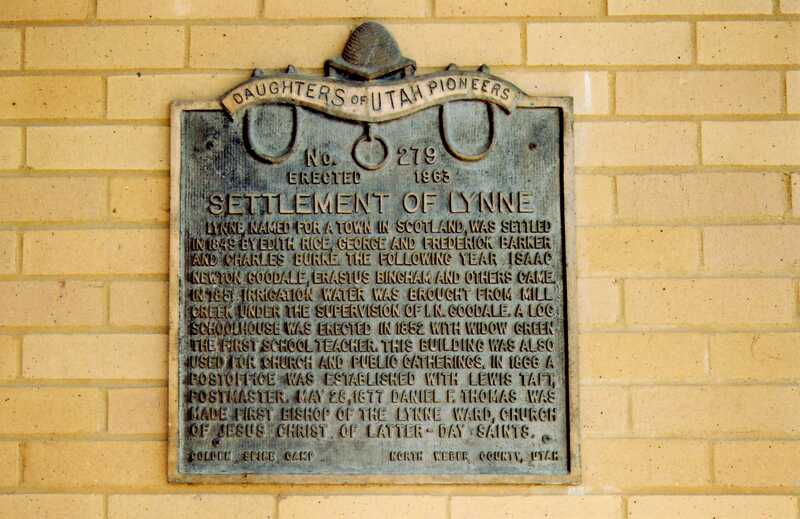 The new building was a culmination of many transitions since the beginning of a ward on 2nd Street in 1851, and The Daughters of the Utah Pioneers dedicated a plaque to the history of the old Lynne Settlement and hung it on the exterior wall of the new stake center by the front entrance in 1963. The building costs were $421 thousand and the donated man hours were about 19,500. It was dedicated in January 1964 by President N. Elden Tanner, first counselor in the First Presidency of the Church of Jesus Christ of Latter-day Saints. 1962 stake center for the Church of Jesus Christ of Latter-day Saints. In 2002 the Ogden 15th Ward name was changed to the Harrisville 8th Ward. Dedicated by Daughters of the Utah Pioneers in 1963. The Bank of Utah bought the old historic brick church on the triangle at Five Points. 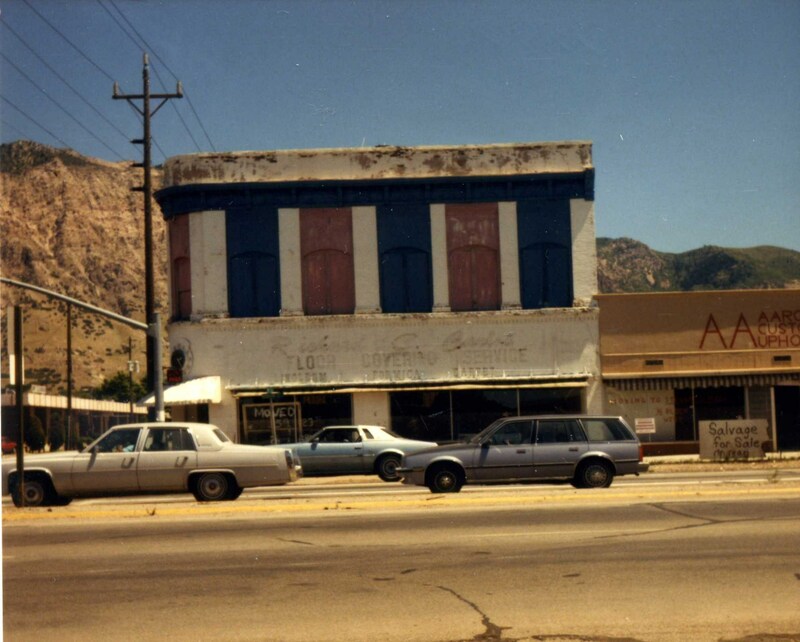 Bank of Utah in 1986. TODAY: Bank of Utah; photo 2011. 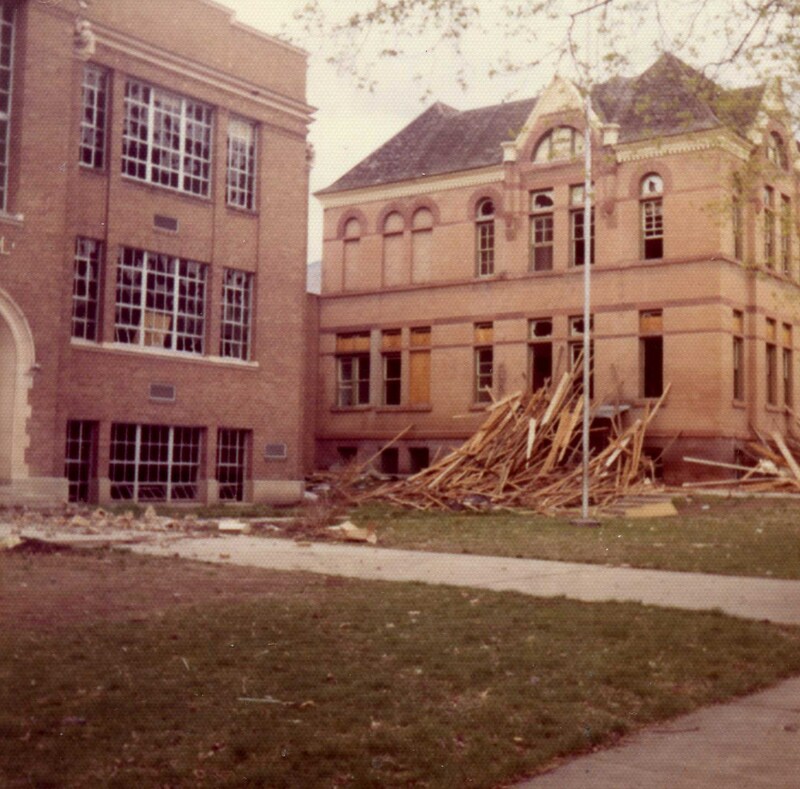 1972 DEMOLITION of the Five Points/ Lincoln School; photo G. Sherner. 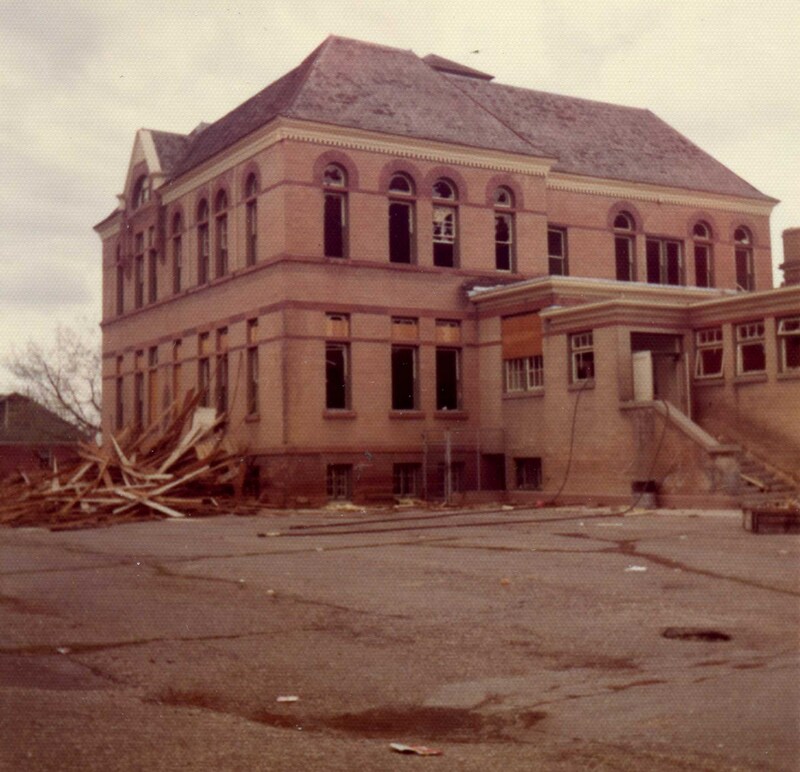 1972 DEMOLITION; rear view of 1892 Five Points School;photo G. Sherner. 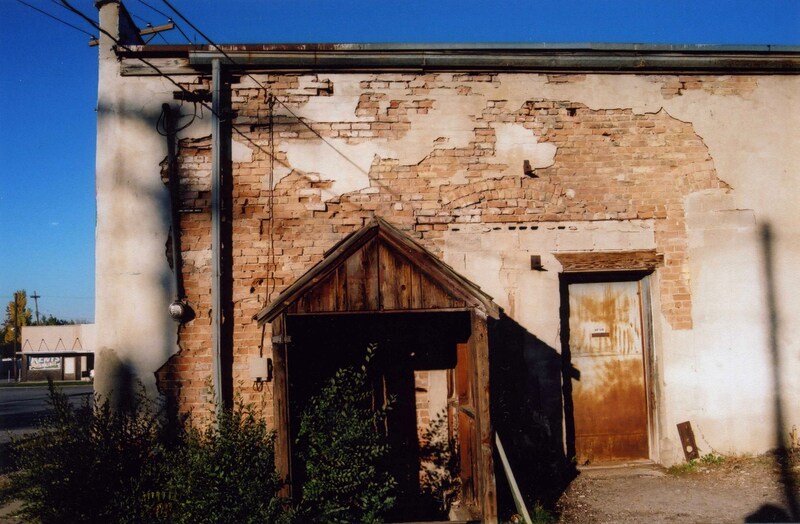 1977 – old office for Pioneer Coal & Lumber before demolition in Jan 1978; photo G. Sherner. 1977 June – Hello to Harmons and Key Bank; photo G. Sherner. 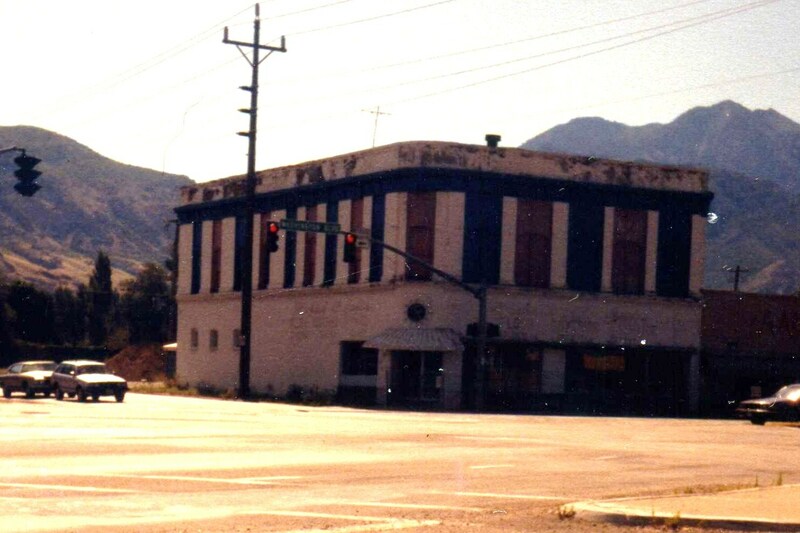 1987 – before demolition of Five Points Drug (Southwell Bld. ); photo G. Sherner. 1987 – windows boarded up for demolition, building almost 100 years old; photo G. Sherner. 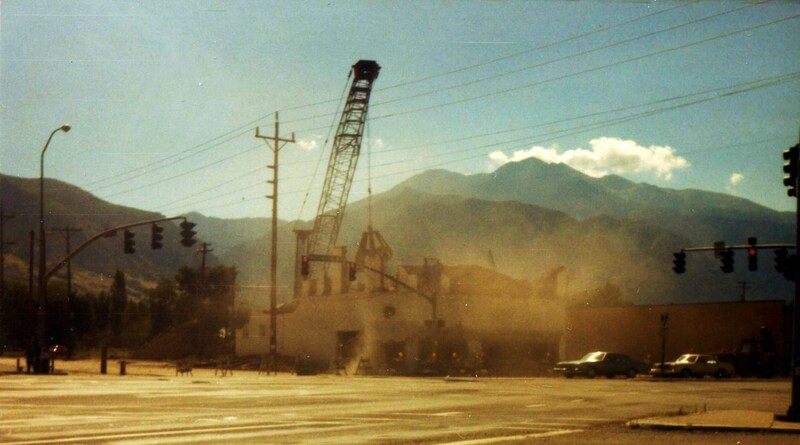 1987 demolition of Five Points Drug; photo G. Sherner. TODAY: SE corner of Washington Blvd. & 2nd St. 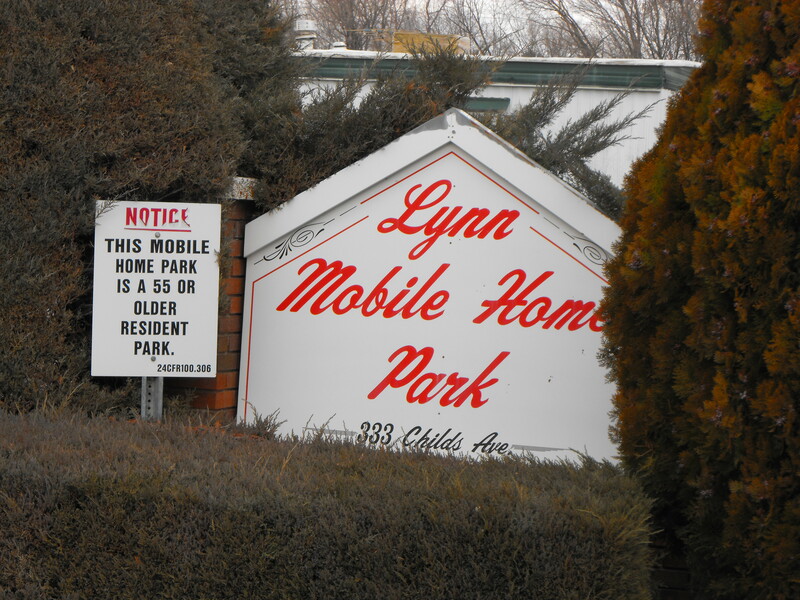 In the mid 1980s Don Higgs opened a mobile home court north of the Romrell Park on 4th Street. He named it Lynn to fit in with the community and also to honor his son. The location of the court was next to the Lynne Ditch, one block north of the third Lynn School, and his son’s middle name was Lynn. It still bears this name in 2015. Another business that still bears the name Lynne in 2015 is the c. 1870 Lynne Irrigation Company. TODAY: 333 Childs Avenue; named for the Lynne Community and the owners son. 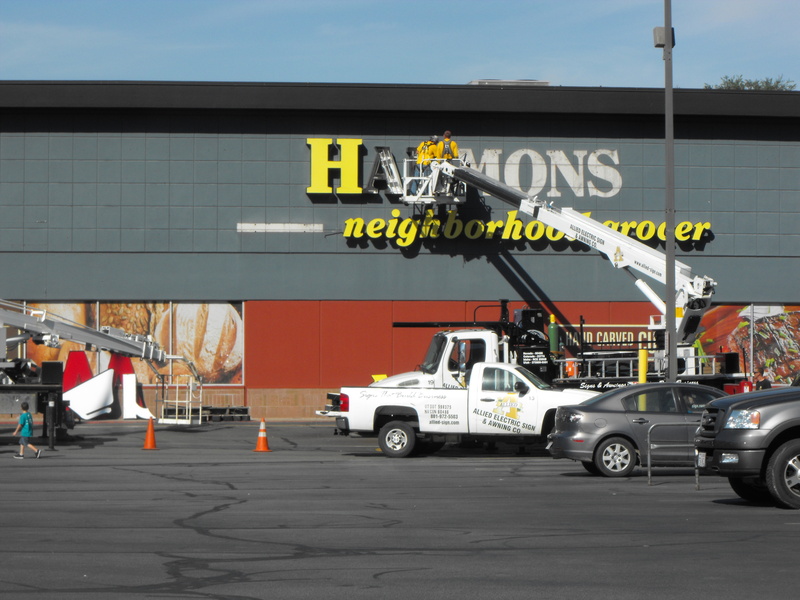 On Sept. 12, 2015, Harmons closed and Wangsgards opened in the former Harmons building. 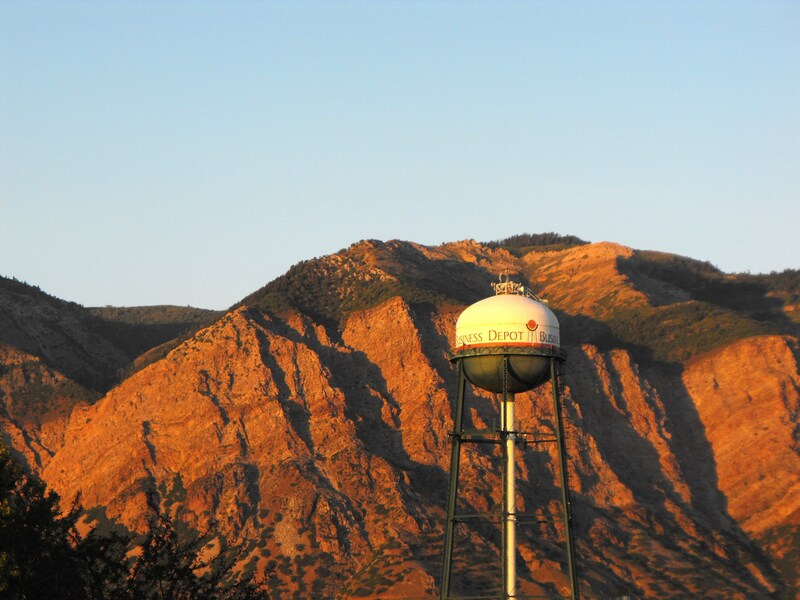 The water tower landmark of the former Defense Depot Ogden is now icon for Business Depot Ogden. 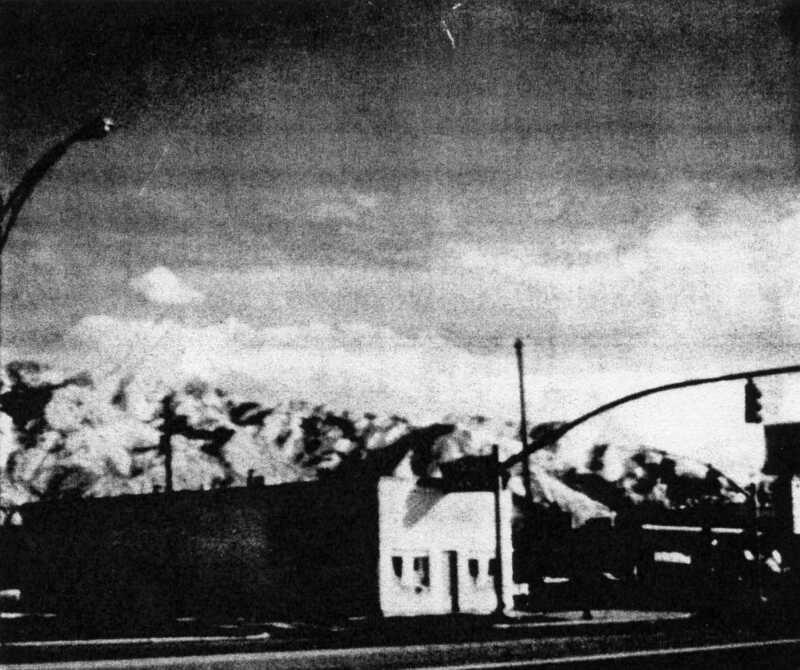 The Defense Depot of Ogden operated for more than fifty years. 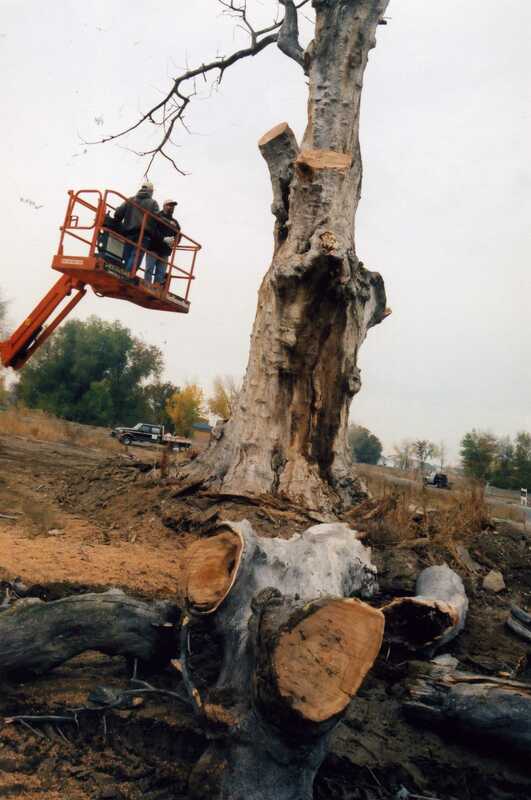 During that time farming continued on 2nd Street in the four block area between Wall Avenue and the Defense Depot Ogden until the late 1990s when the DDO was purchased by Ogden City for the Business Depot Ogden. The formal sale took place in 1997. 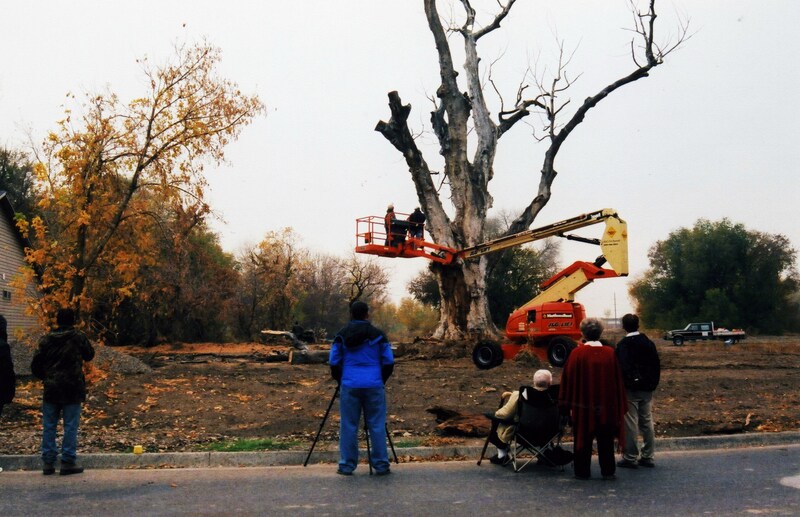 With this surprising change from an army depot to a business park, property values escalated and most of the old pioneer farms on West 2nd were sold from 1995 to 2007 for subdivisions with the exception of the 40-acre Bingham/Stone farm which was listed on the National Register of Historic Places in 2003. 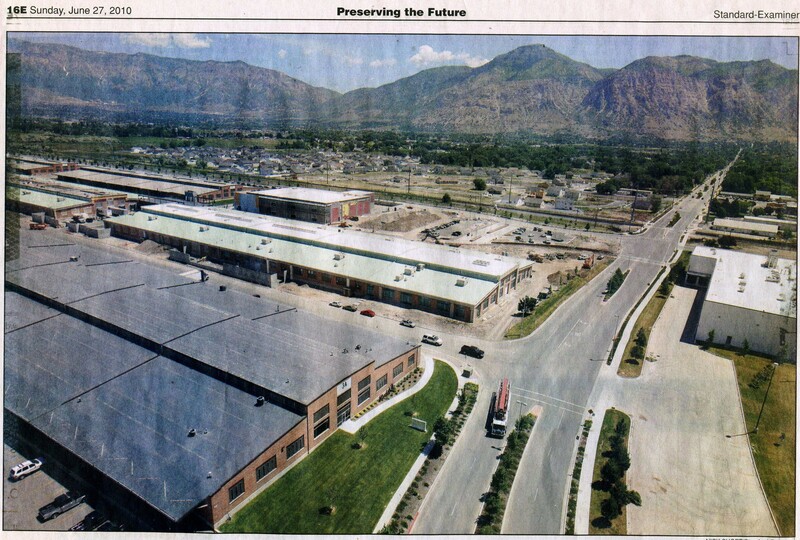 This photo taken from the water tower in BDO shows construction continuing on the Barnes Aerospace building in 2008 and in Fort Bingham subdivision; photo taken from water tower by Nick Short/Standard Examiner 27 June 2010. 2 SUBDIVISIONS on WEST 2ND ST.
ASPEN ACRES subdivision is located on an old pioneer farm; construction began in 2000. ASPEN ACRES Subdivision begins at intersection of 2nd and Lynne School Lane and extends northward. 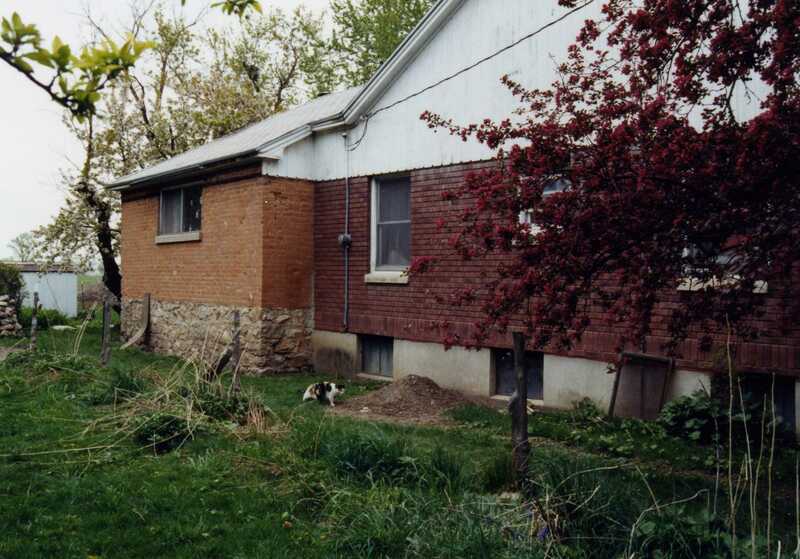 The Aspen Acres subdivision started in 2000 on the Stone/Reno farm. 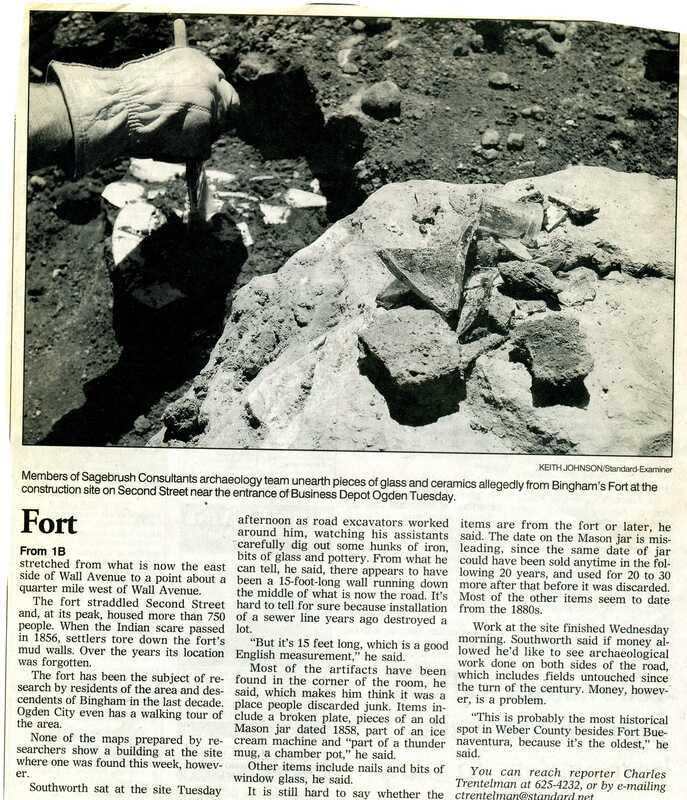 Before the new Lynne School Lane was graded and paved, there was an excavation of the old Lynne School foundation, sifting through the dirt to find artifacts. 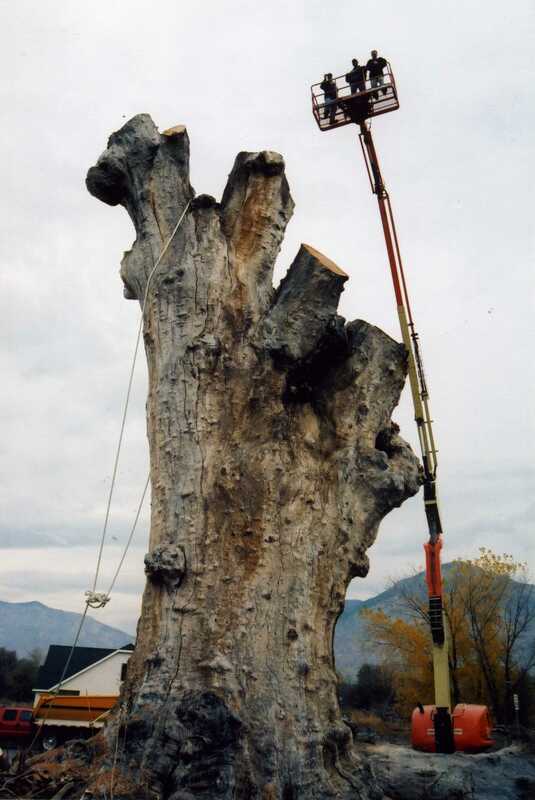 This was made possible through the generosity of Carl Nelson of Nelson Intermountain Crane. 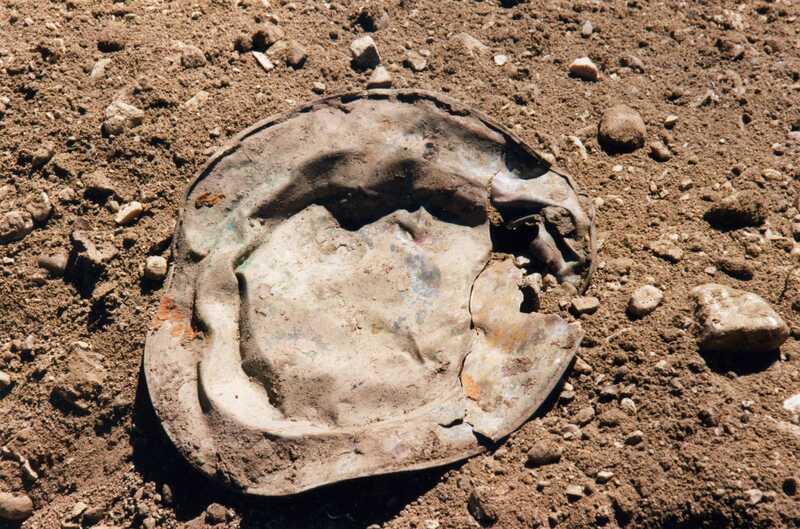 Sagebrush consultants did the survey of the old historic site and cataloged the artifacts. 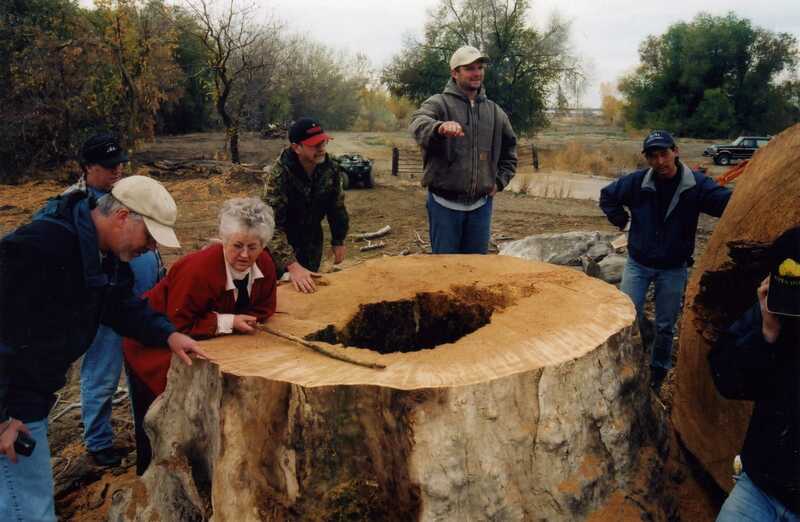 L: rock foundation of old Lynne School; R: volunteeers sifting through the dirt; photos Oct. 2000. 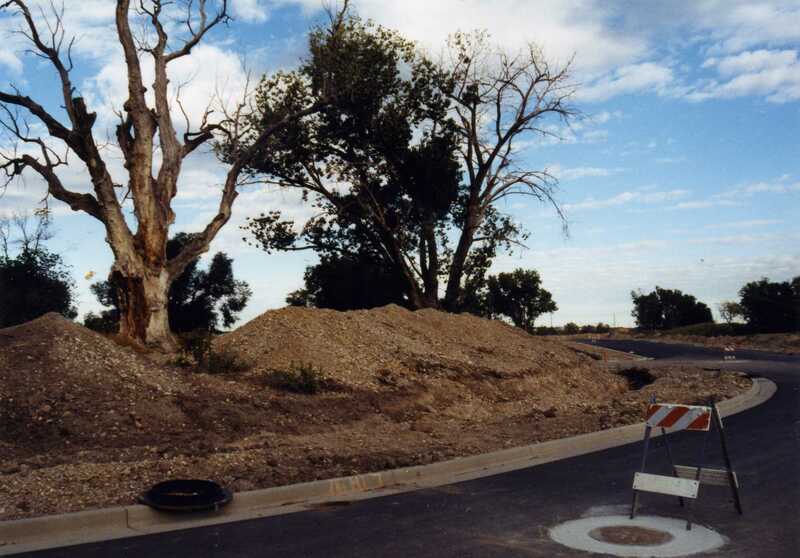 Century Dr. was first road of Fort Bingham subdivision; Indian tree on left was located at today’s address of 145 Century Dr.; photo 2004. Early houses built in Fort Bingham subdivision near the Indian tree; photo 2005. 1. Cutting of the tree begins. 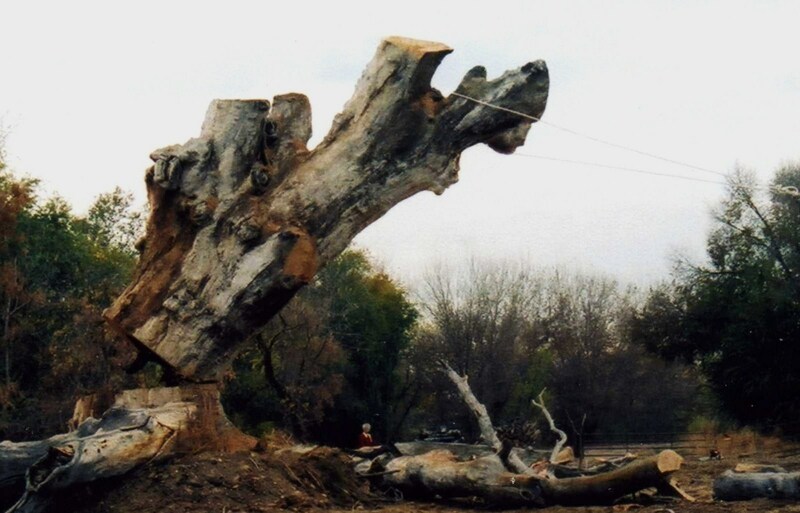 For historic accounts of the Indian tree see Indian Camp Road. 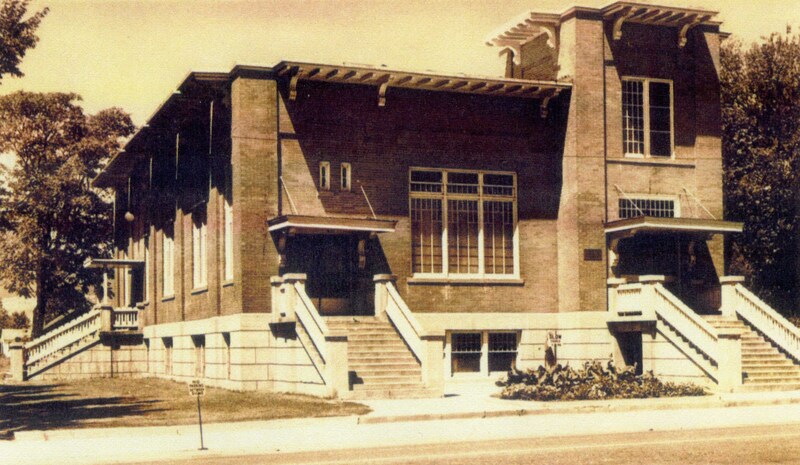 The Heritage School, named for the rich heritage of the area, replaced the 1950s Lynne School on Grant Ave. and became the 7th school of the Five Points community. 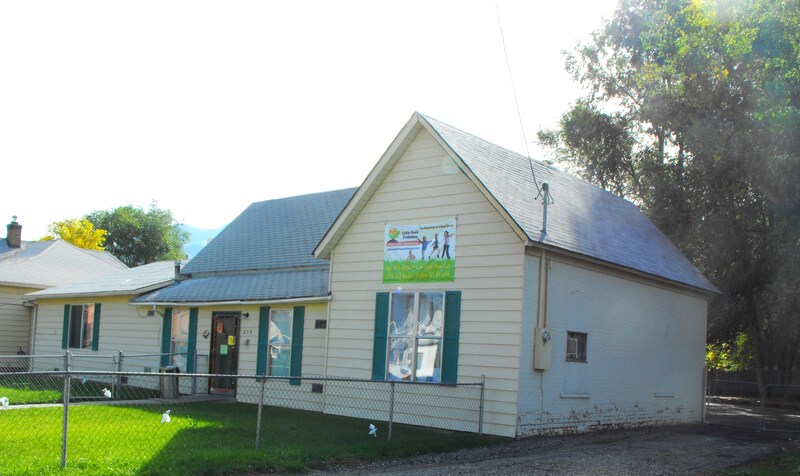 Its location is only two blocks south of the first 1853 Bingham School House. of the community; opened 2008. 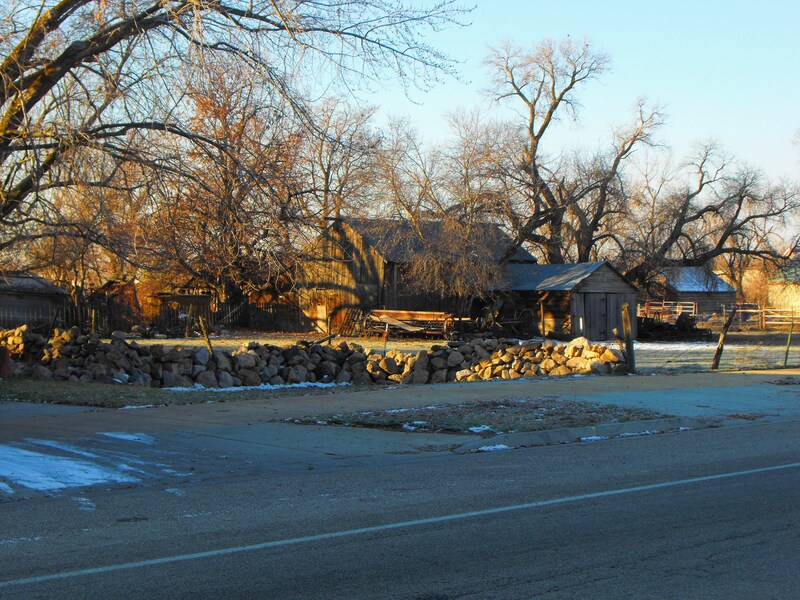 Twelve pioneer houses, the Bingham/Stone Farm, and other historic residences and outbuildings still remain on 2nd Street from Five Points to the Business Depot Ogden as seen in adobe granaries, wooden barns and updated farm houses. A history of each house and the farm is listed on the home page. 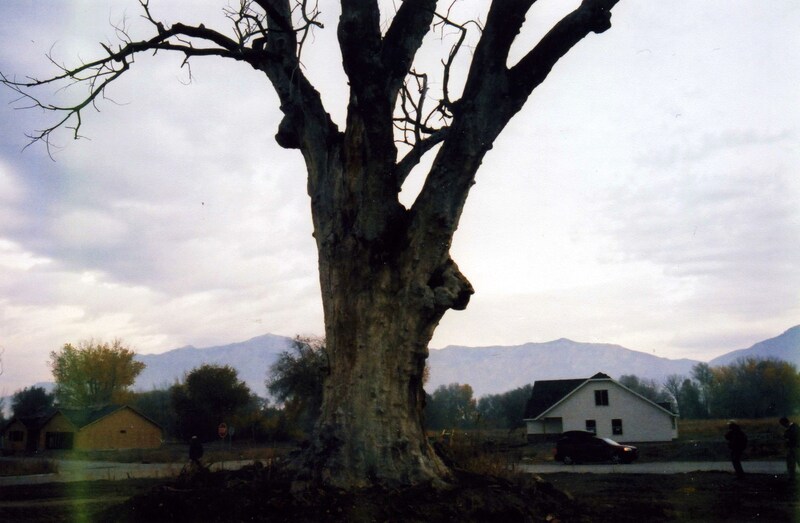 Next to Fort Buenaventura, the 1851 farm is the oldest site in Weber County. Copper plate found in 2002 excavation for sidewalk, dated between 1858 and 1880. IF YOU HAVE PHOTOS OR STORIES YOU WOULD LIKE TO CONTRIBUTE TO THIS HISTORY, PLEASE CONTACT US AT <binghamsfort@gmail.com>. [70a] Andrew Jensen, History of the Lynne Ward, p.1. [70b] Arch D. Clapier (1902-1993) Reminiscent Memories, Written down by Josee Clapier Fenstermaker Lake and son. [70c] Interview James I. Lefgren, October 27, 2001. [70d] Standard Examiner, Death Claims J. D. Wangsgard, June 16, 1936. [70e] Pearl Stowe, Ogden Utah 8th Ward, Lorin Farr Stake, 1908-1980, 1985, p.315,317. [70f] Ibid, p. 323. 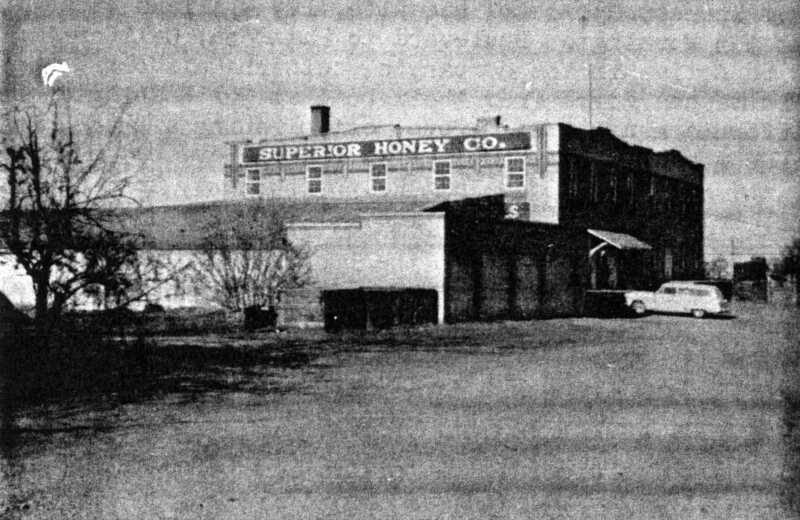 NOTE: The Superior Honey Co. building burned down in about 1954. A troubled young man that was “mad at the world” started the fateful fire and later confessed and was arrested. The judge gave him the option of going to jail or joining the army, and he chose the army. Interview with Hazel Anderson Gunnison, February 22, 2002. [71a] Interview with Helmer (Tug) Anderson, August 16, 1999. [71b] Ida Mae D. Hipwell, OGDEN UTAH WEBER NORTH STAKE HISTORY, c. 1990, p. 292. [71c] Ibid, p. 292, 293. 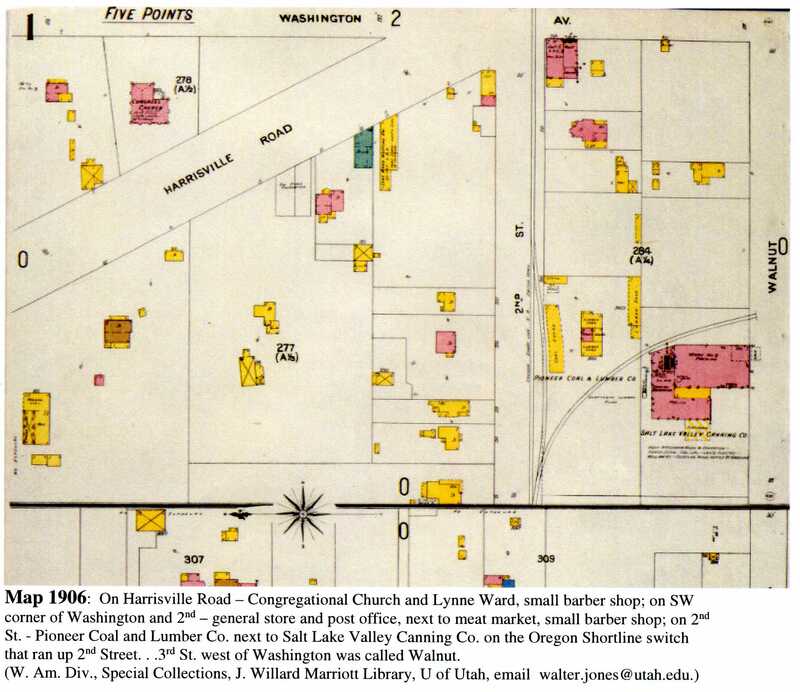 Colleen Blankenship, Lawrenc William Sherner, manuscript, 2004, p.4; History of the Ogden 15th Ward, p. 13; Museum Memories, International Society Daughters of Utah Pioneers, Salt Lake City, Utah, 2009, Vol. 1, p. 366. [72a] Pearl Stowe, Ogden Utah 8th Ward, Lorin Farr Stake, 1908-1980, p. 53, 92, 295. [72b] Ibid p. 313,-318, 320; interview Jimmy Lefgren Oct. 27, 2001. 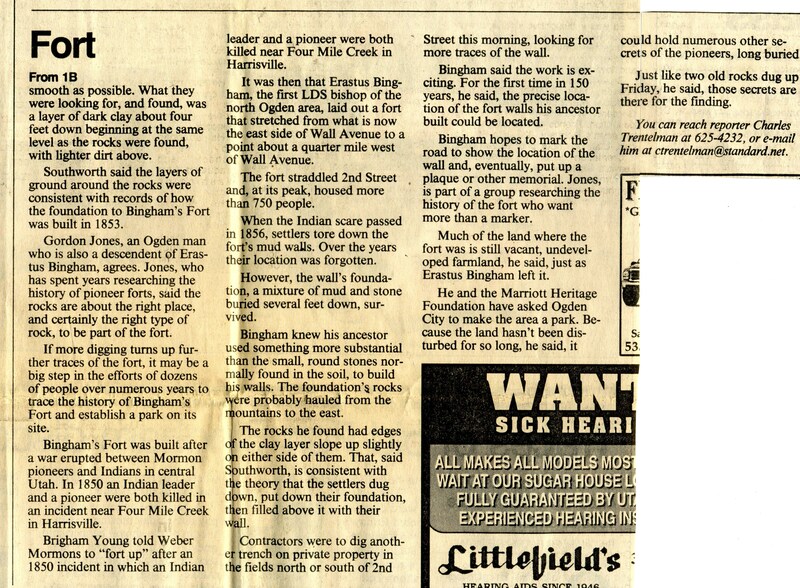 Richard C. Roberts and Richard W. Sadler, A History of Weber County, p. 251, 311; Susan Snyder, Residents Cry Foul at Defense Depot, Ogden Standard Examiner, Feb.21, 1999; DDO, Ogden Standard Examiner, June 3, 2005; DDUO History Book, 1996, Kinara Graphis, Inc., Ogden, Utah, p.9-11. [73a] Richard C. Roberts and Richard W. Sadler, A History of Weber County, p. 268. [73b] Donna Montgomery Hill, Memories, manuscript, 2010, p. 1 and Memories, 2015, drawing and map. [73c] Interview Bernell K. Stone, February 27, 2012. [73d] Standard Examiner, Second Street Track Repairs Are Promised, August 26, 1942. [73e] Standard Examiner, Boom at Five Points, c. 1945. [73f] Joyce B. Maw, Biography Harold Bramwell, p. 18-21; interview Jimmy Lefgren, October 27, 2001; http://en.wikipedia.org/wiki/The_Osmonds#The_Osmonds.27_Story (3-16-2012); http://en.wikipedia.org/wiki/The_Osmonds (5-31-13). 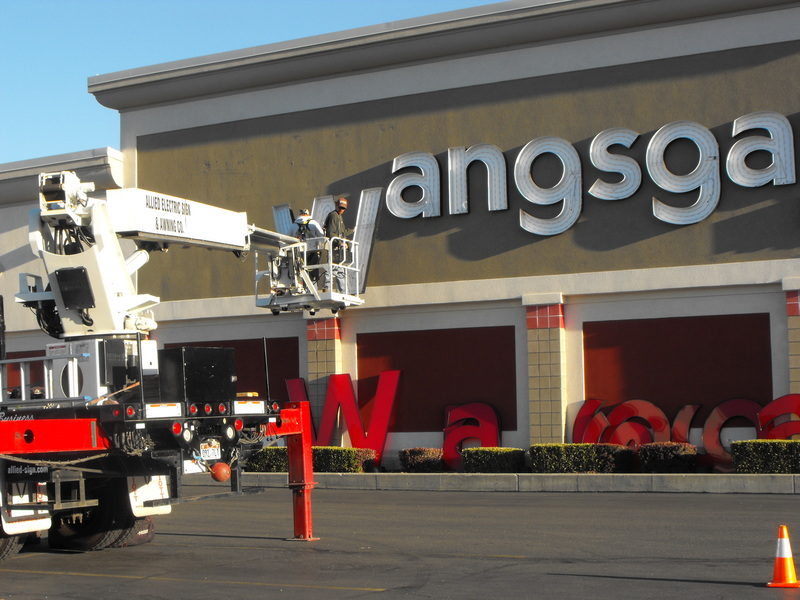 [73g] Wangsgards and Harmons sold to Ridley’s in spring/summer of 2015. Interview Don Higgs Aug. 5, 2008. Jeff Demoss, Standard Examiner, Bounty of the Depot Awaited, Feb. 27, 2005, p. E1. Autobiography of Sarah Stone Brown Crowther (1872-1963), manuscript typed 1959, p.1. 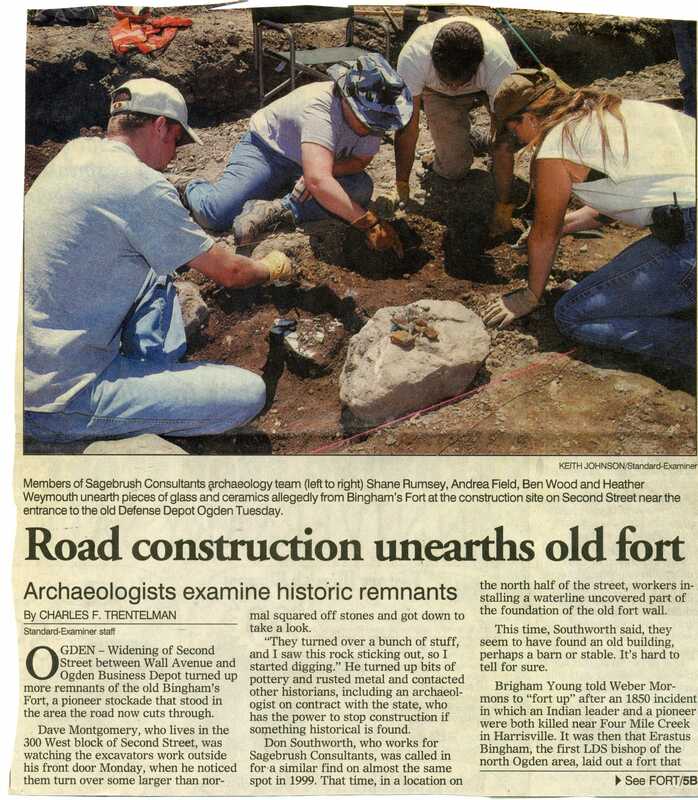 77] Charles F. Trentleman, Road Contruction Unearths Old Fort, Standard Examiner, 2002. This entry was posted on March 31, 2012 at 8:12 pm	and is filed under 1. HOME PAGE & 1849-1869 CHRONOLOGY, b. 1900-present. You can follow any responses to this entry through the RSS 2.0 feed. You can leave a response, or trackback from your own site. I LOVE these entries. Thank you to all who did the hard work of compiling and writing this. Thanks for the memory tour for part of my youth.